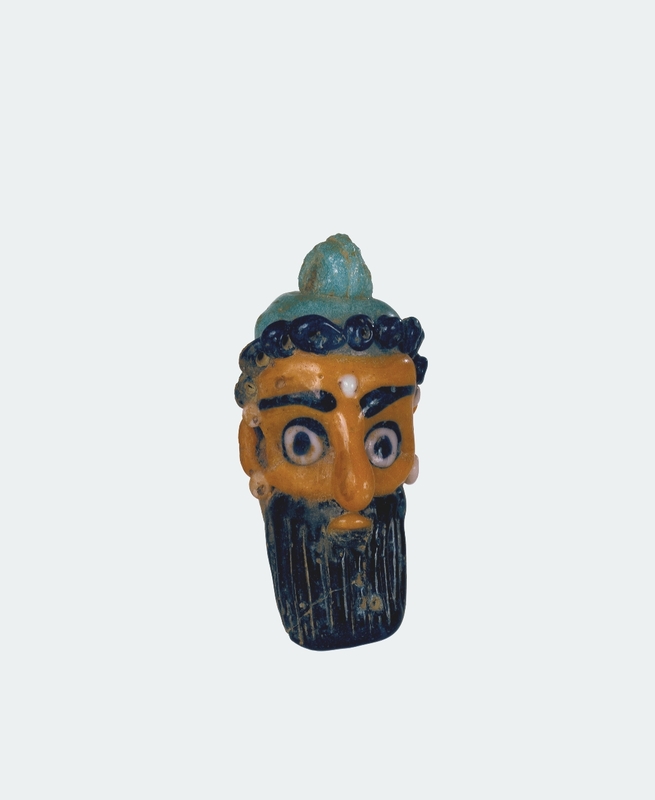 Symbolizing power, enabling ornamentation, and facilitating trade, glass beads are miniature masterpieces that have played significant roles throughout time and across cultures. 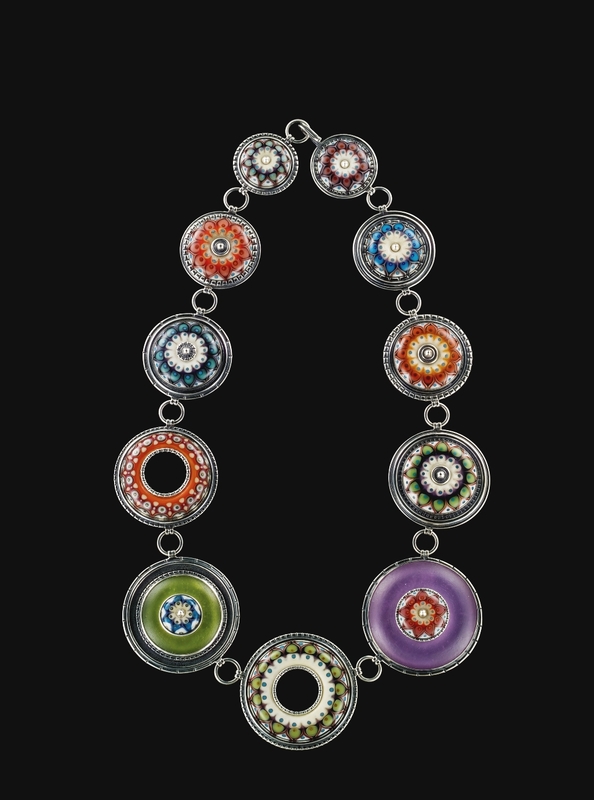 Through the interweaving of themes and objects, glass beads and bead work from around the world become relevant not only to those who made and utilized them in the past, but to modern society as well, since the practice of bead making and bead working has continued uninterrupted for 35 centuries. 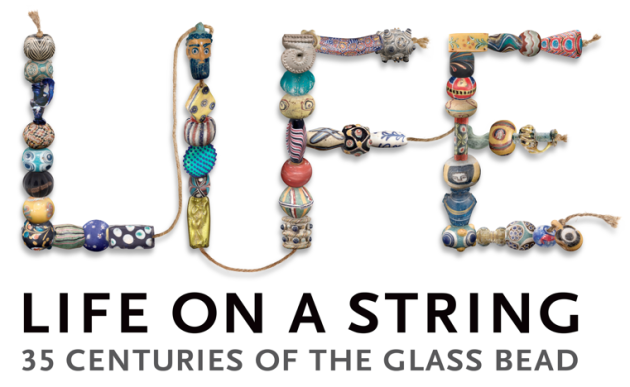 “Life on a String: 35 Centuries of the Glass Bead” showcases, for the first time, nearly 200 important works from the large historical glass bead collection of The Corning Museum of Glass. 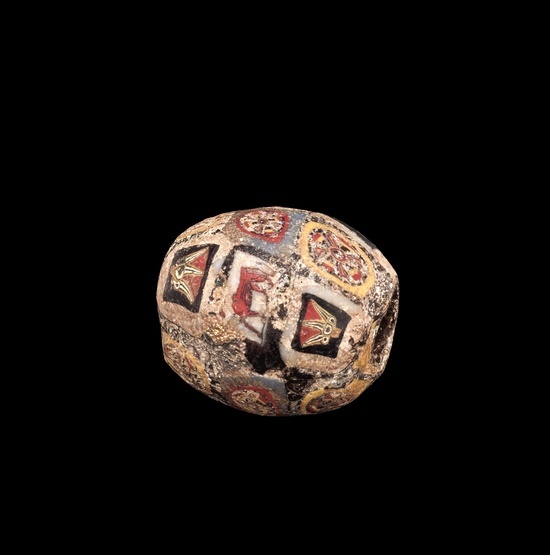 Life on a String explores the use of glass beads for fashion and ornament, as symbols of power and wealth, as traded goods, and as objects of ritual, as well as illuminate the processes of bead making and bead working. 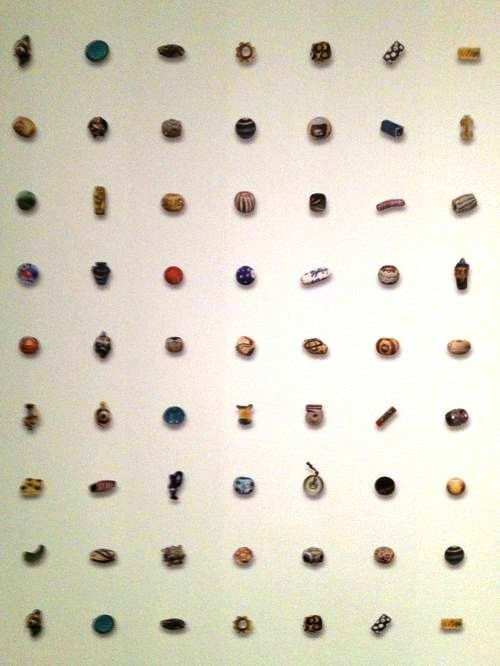 Glass beads are truly remarkable objects—they are the miniature masterpieces of the Museum’s collection. 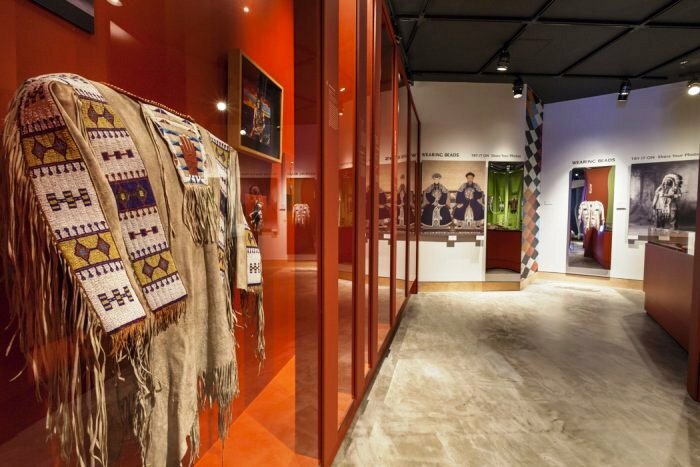 These works are important not only for their artistry, but also for the way they are used to convey social and political messages, and for the manner in which beading traditions have been carried on over many centuries. Through their manufacture and function, they are one of the strings that bind humanity together. 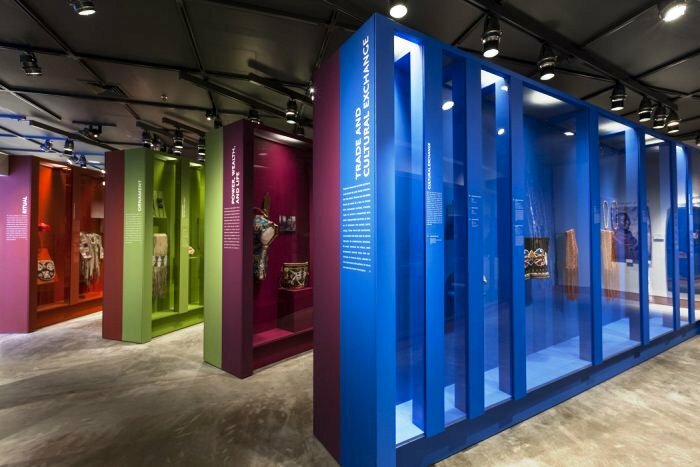 “Life on a String” celebrates this common bond while also revealing the distinctiveness of different societies through their use of glass beads to celebrate their unique cultural heritage. 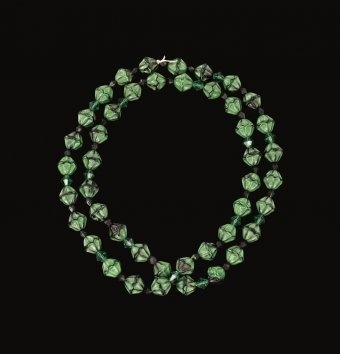 Highlights of the exhibition include early Venetian chevron and millefiori beads, Roman mosaic beads, West Africa bodom beads, Egyptian eye beads, Chinese horned eye beads, Japanese magatama beads, Bohemian beads imitating precious stones, North American bead worked garments, and contemporary beaded objects by Joyce Scott and David Chatt. The size of glass beads often belies their importance. 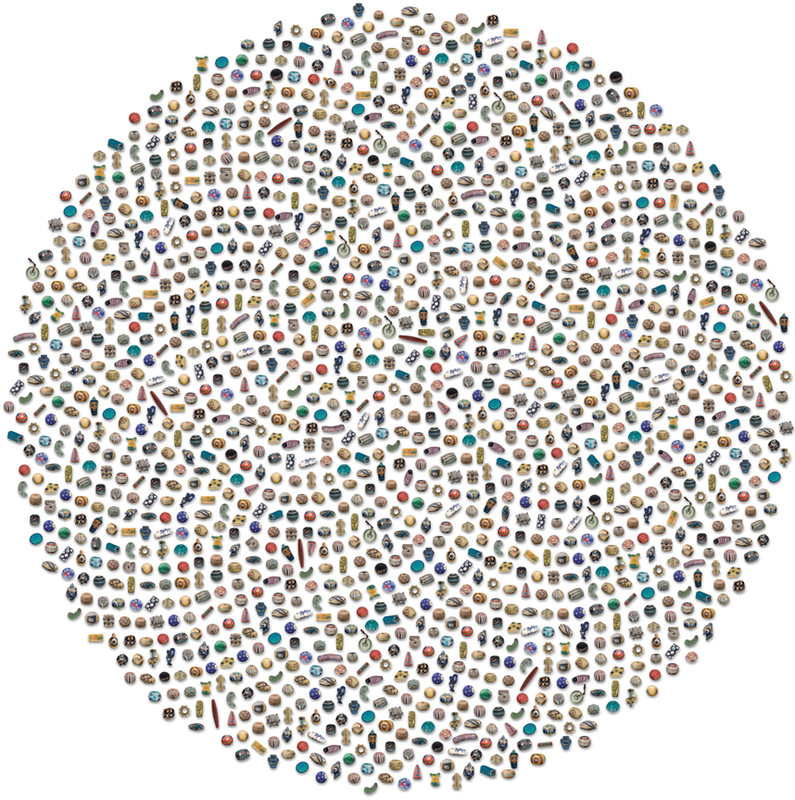 They can represent wealth, symbolize gender and family relationships, or indicate social status, all through meaning signified in their color and patterning. 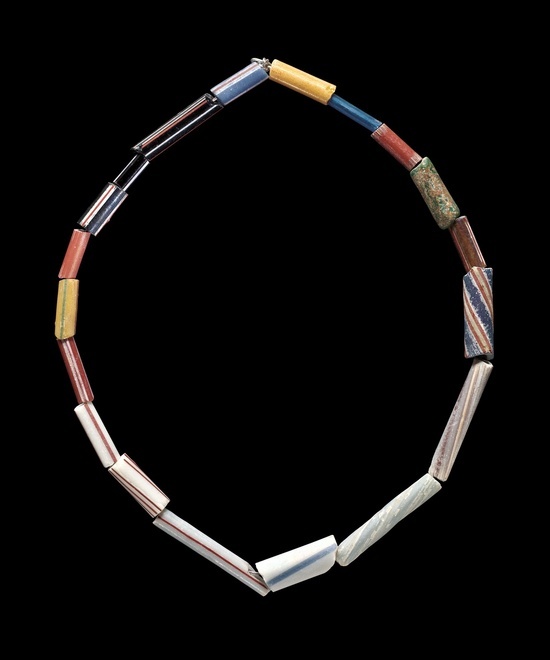 Economic and political relationships around the globe—especially during the period of European colonization—are embodied in the beads manufactured in Europe and distributed in Africa and North America. 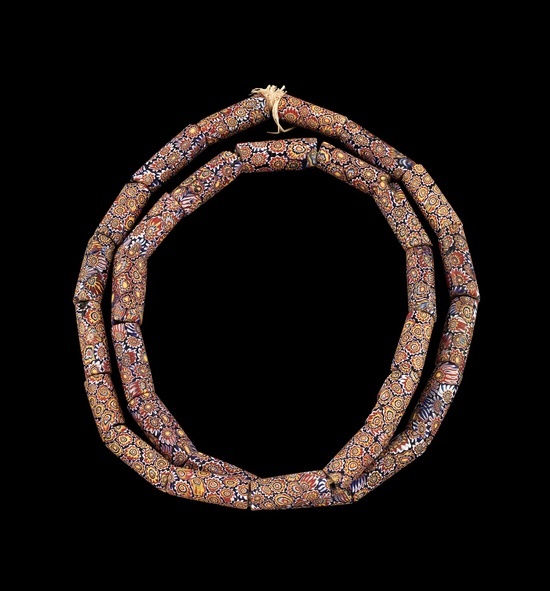 Their styles influenced indigenous bead production, and ultimately, beads made in formerly colonized lands followed a reverse course back to Europe. 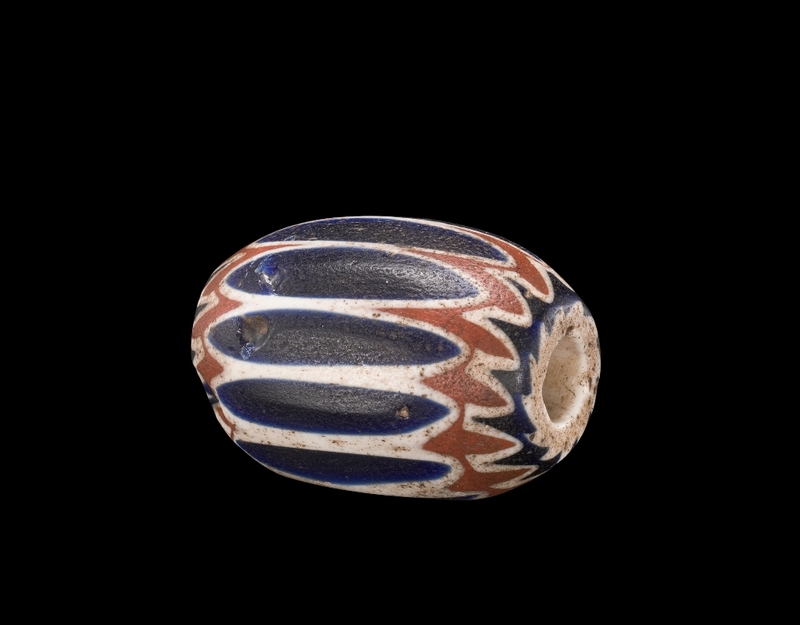 Traded globally for centuries, glass beads are among the earliest attempts at glass production and have been found at ancient glass manufacturing sites in the eastern Mediterranean from the second millennium B.C. 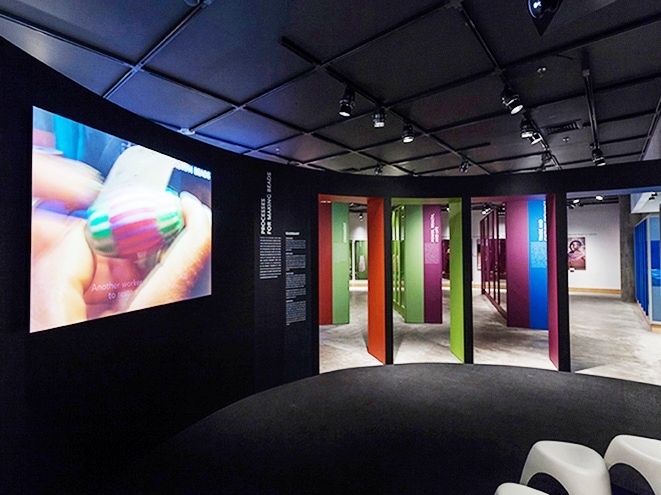 The beads in the exhibition demonstrate the variations in manufacturing techniques used to create beads and beaded objects through time. 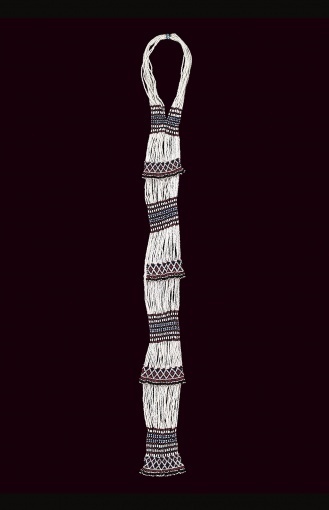 The glass beads and beaded objects have beeen arranged thematically, comparing the manner in which diverse cultures have utilized beads, frequently for the same purposes, but sometimes for unique reasons. 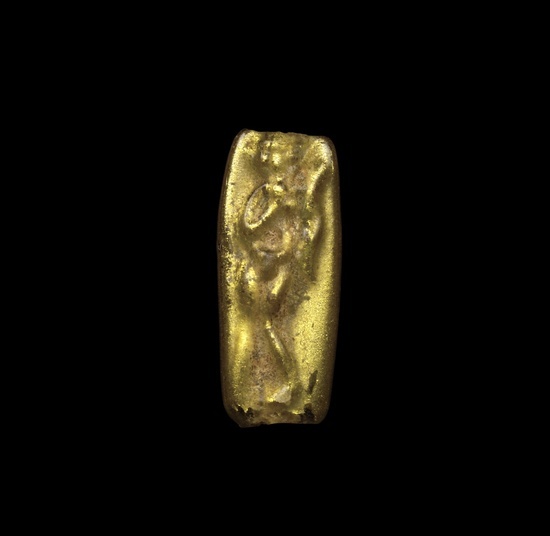 These themes explore how glass beads adorn the body and our possessions; how they convey messages about power and wealth, and identify the stages of human life; how they serve ritual purposes, as well as decorate clothing and objects used in rituals; and how they have been employed across the centuries as a means of exchange, both commercial and cultural. 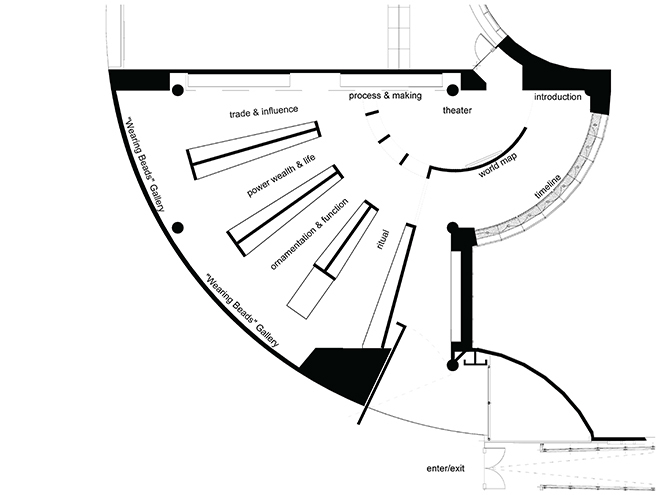 Harry Allen’s radial layout responds to the round room of the Gunnar Birkerts designed Museum building. 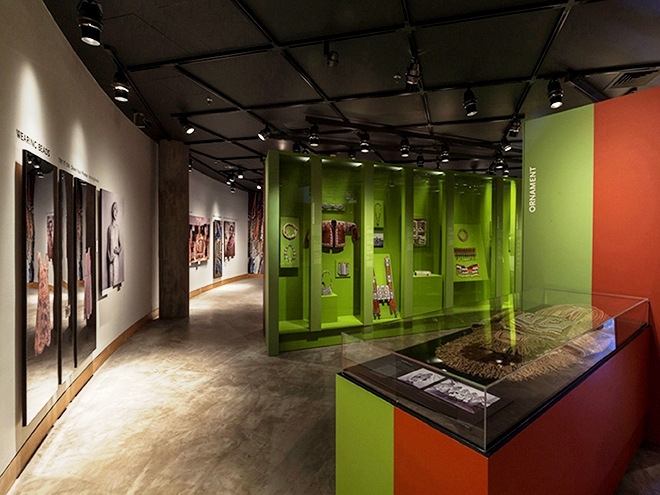 The objects on display are housed in tall, fully saturated cases, designed to highlight the colorful beads, accommodate the wide variety of materials on display, and bring the objects on display up to eye level. 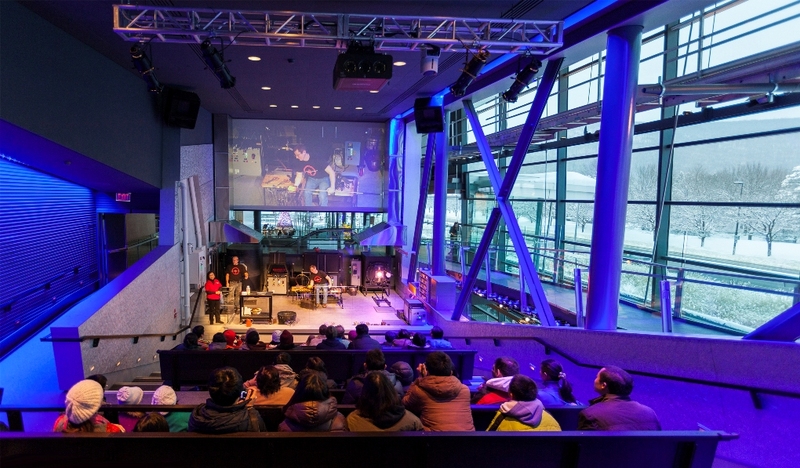 To engage the viewer, Harry Allen developed three interactive areas in the exhibition. 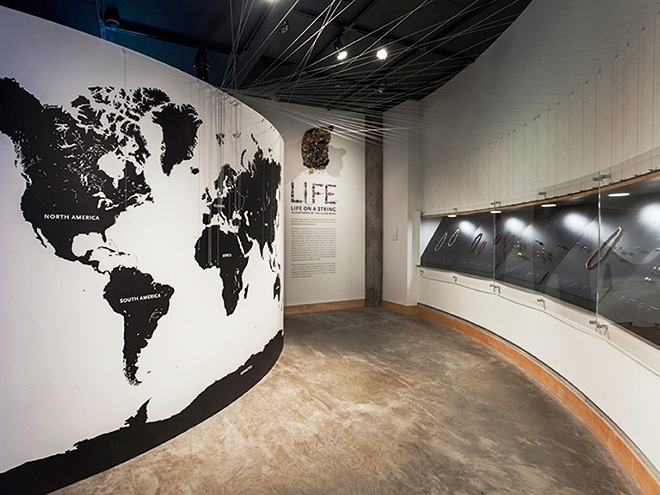 The Timeline, which places important beads in historical context, is cross referenced to a map on the opposite wall by a web of strings that crisscross overhead; beads are thus placed in a historical context as well. 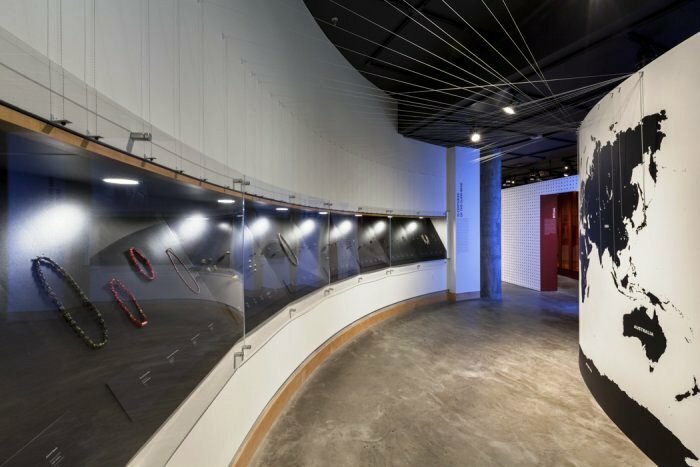 A small round theater at the heart of the exhibit features a video as well as a display of bead making tools. 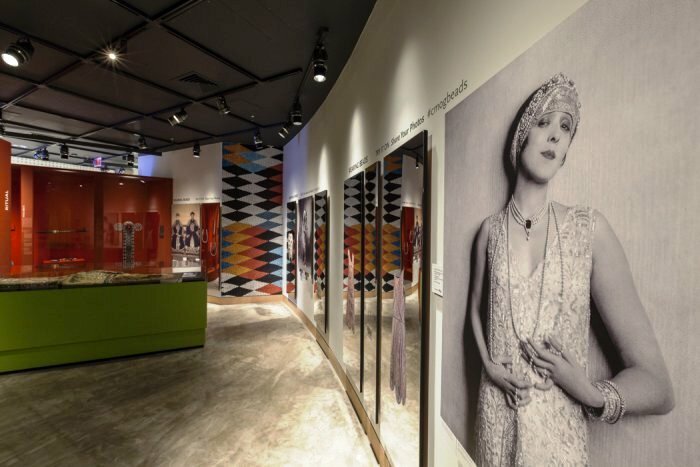 The “Wearing Beads” gallery combines images of beads being worn in various cultures with images of beaded garments mounted on mirrors. 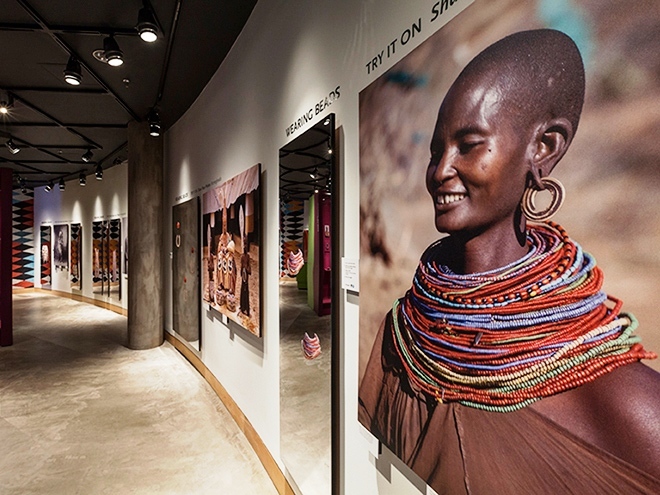 Viewing themselves in the mirrors visitors can imagine themselves in beaded flapper dress and Samburu necklaces. 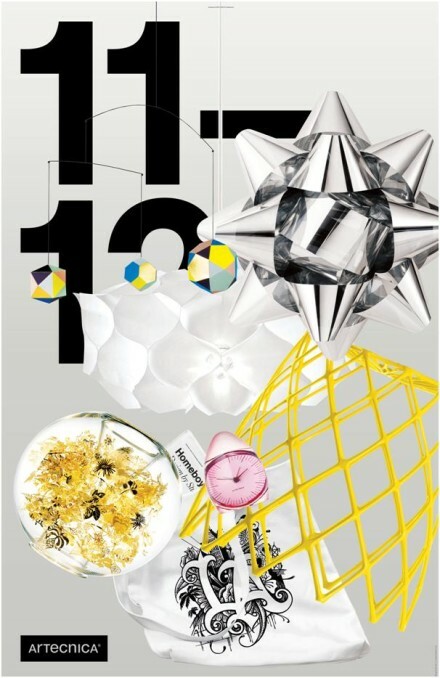 Harry enlisted longtime collaborator Stefan Hengst to develop a graphic identity for the show. 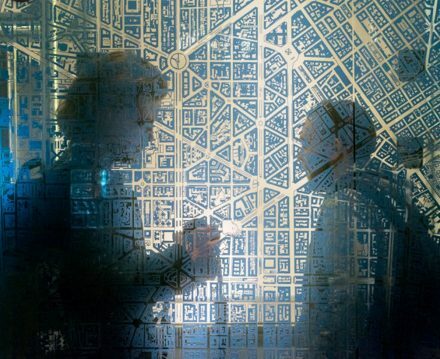 The most striking innovation in the graphic treatment is the complete digital nature of the application. 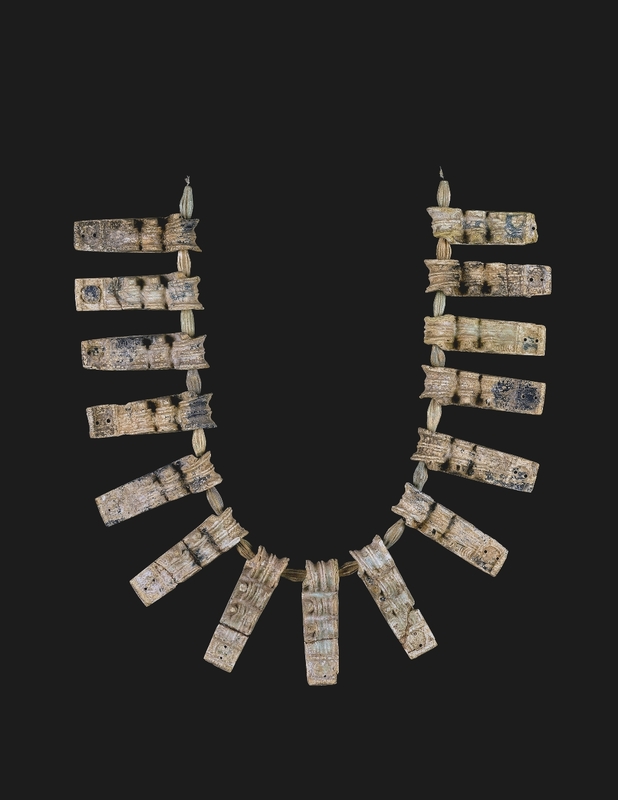 The emphasis was on the beads themselves, which provide great visual interest. Beads form the logo and are applied as patterns on the wall. 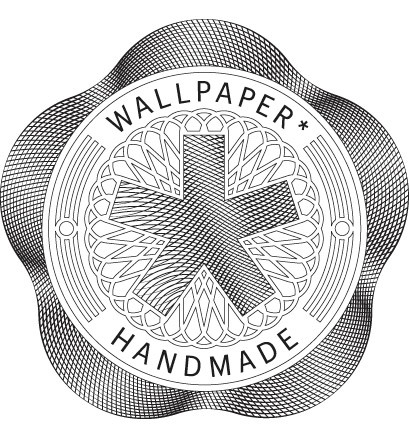 Stefan started a wallpaper company last year and most of the graphics in the show, from the entry logo to the object description, are applied seamlessly as wallpaper. 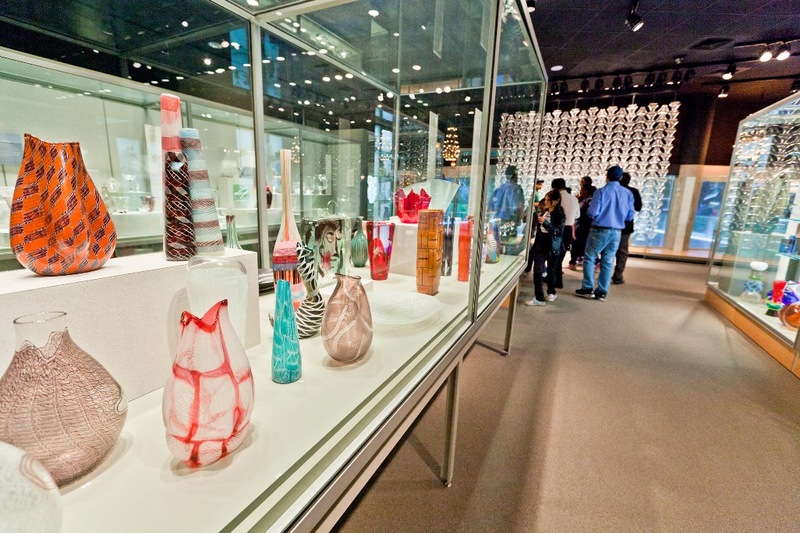 An understanding of the history of glass would not be complete without acknowledging the importance of glass beads both as a products of early manufacture in the medium and as artistic representations of diverse cultures and societies. 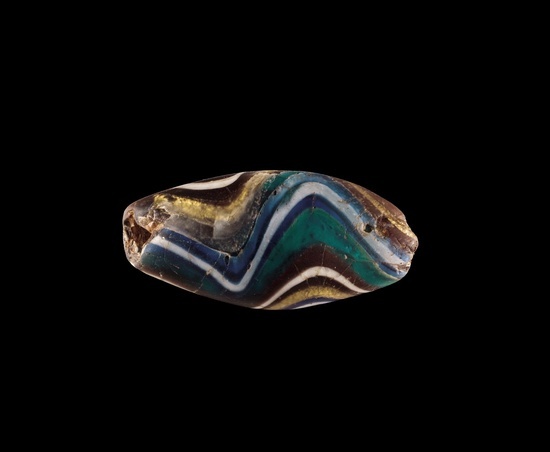 Glass beads have been found at the earliest glass manufacturing sites in the eastern Mediterranean, leading to the knowledge that making beads must have been among the earliest attempts at glass production. 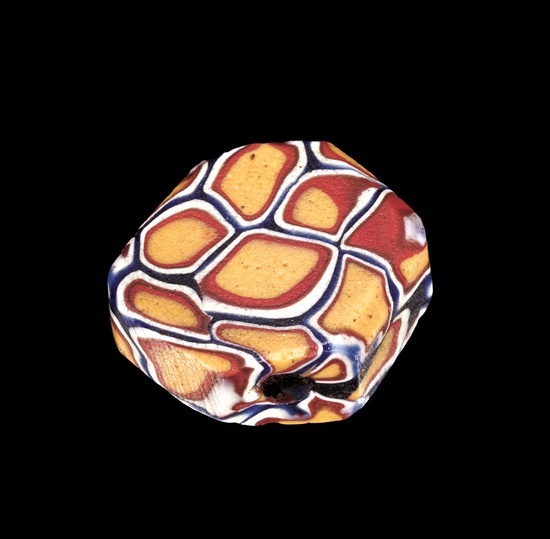 The great variations in design and manufacturing techniques over nearly 35 centuries allow glass beads to tell the stories of not only their makers, but of those who used beads for various purposes and in a variety of manners. 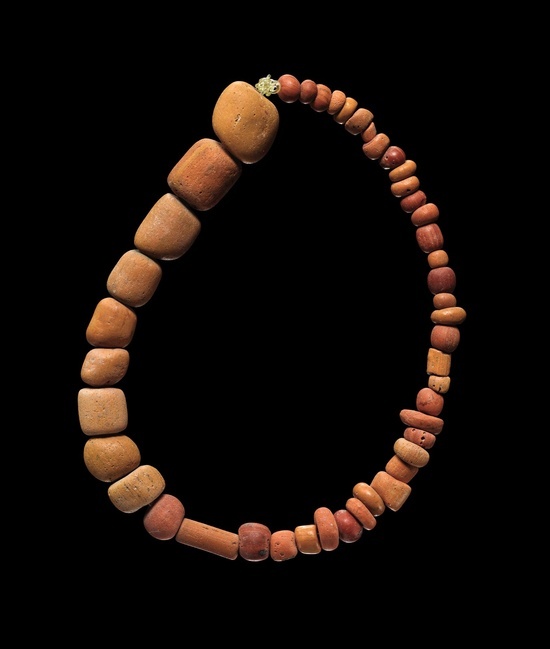 For 30,000 years, mankind has crafted beads from natural materials. 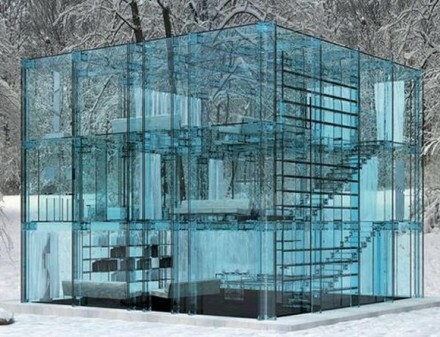 With the discovery of glass making in the second millennium B.C., glass began to be used for this same purpose. Glass beads are universal. 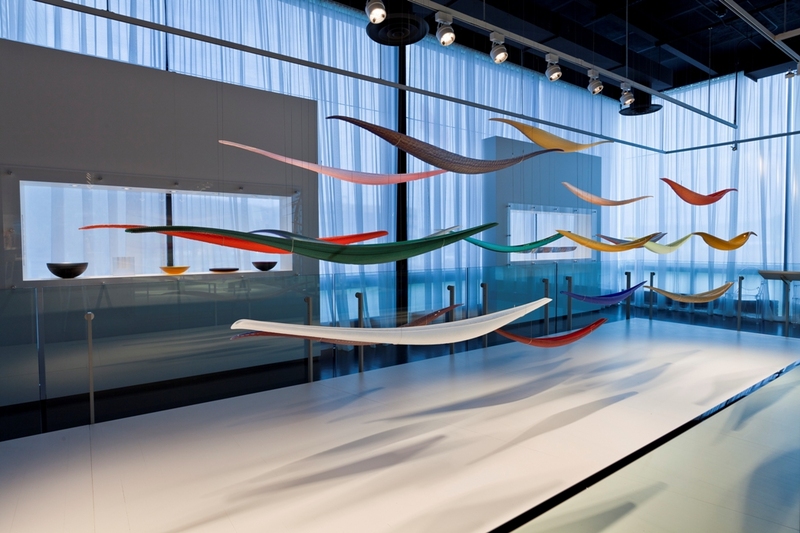 They have been produced throughout the 35 centuries of glass manufacturing, and by nearly every culture in the world. 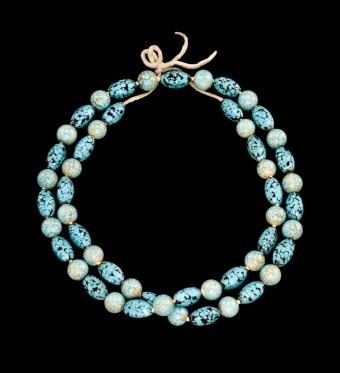 Across time and around the world, glass beads have become a common element of mankind. 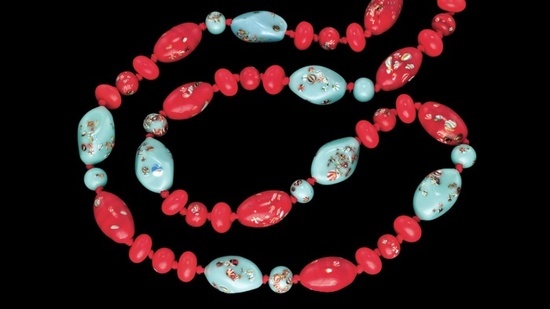 Through the centuries, beads have been made using a variety of processes. 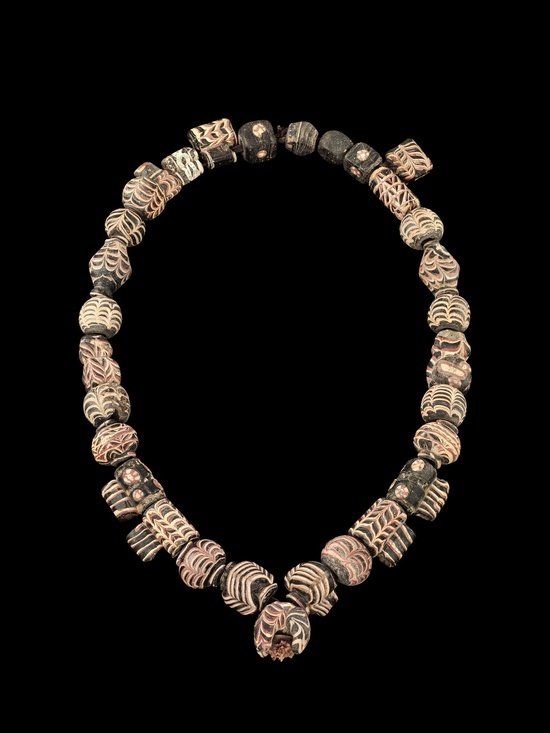 Understanding how beads were made has allowed scholars to follow the transmission of beads and bead making techniques across the globe. 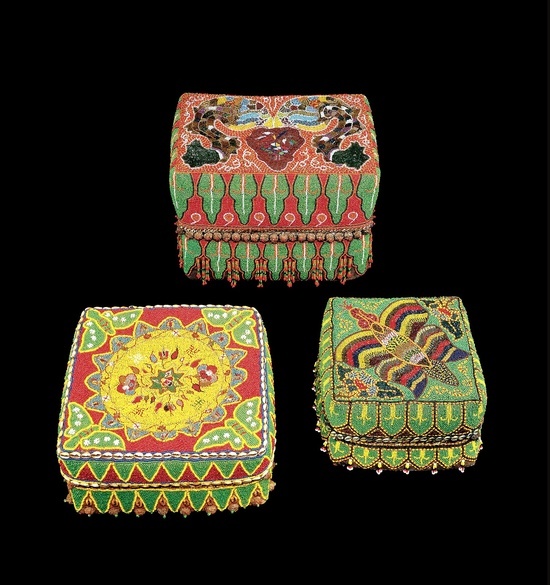 The desire for ornamentation, the need to make an item beautiful as well as functional, has been an inherent part of many cultures around the world. Over time, this need has been answered in diverse ways and glass beads became an important element in ornamentation. 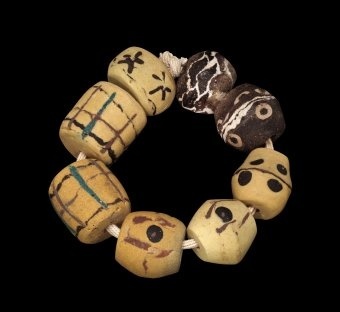 Beads played an important role not only in life, but also in death. 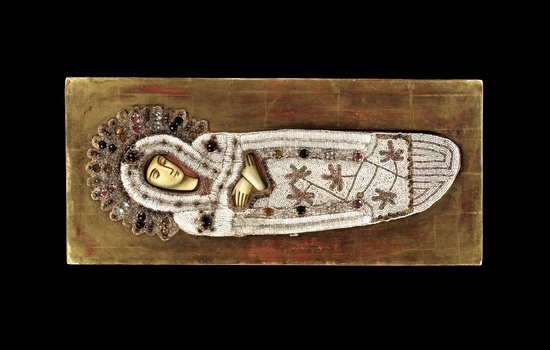 Bodies in Egyptian burial chambers are found to be adorned with nets of stone and faience beads; women carry elaborately seed-beaded purses to show off their personal style in the early 20th century; and the Bagobo of the Philippines cover their clothing, baskets, and belts in glass and shell beads because of their love of ornament. 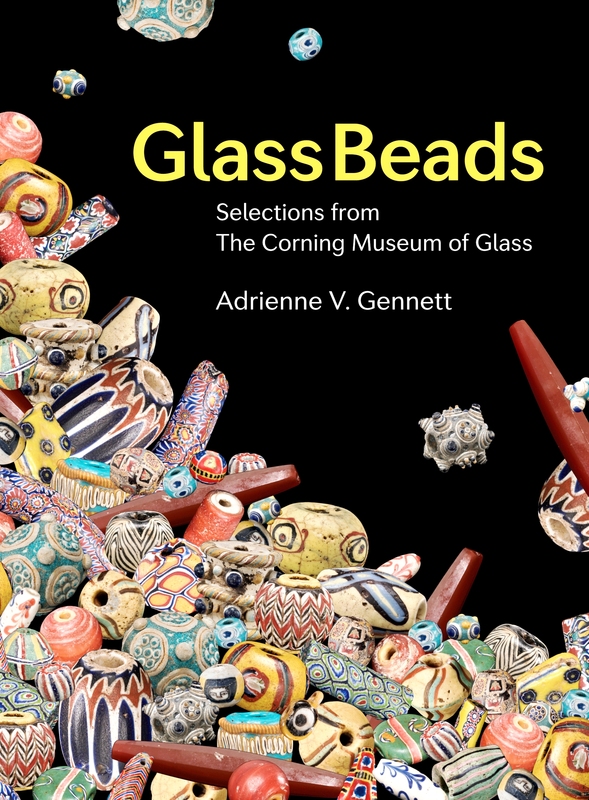 These are just a few examples of how glass beads (along with beads made of natural materials) have played a part in ornamentation, an element of humanity that has existed since our inception and will continue long after those of us here now. 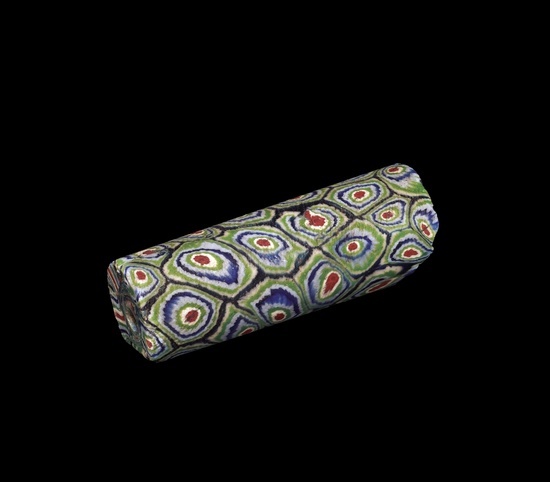 Chevron Bead, cased, drawn, ground. Italy, Venice, about 17th–18th centuries. 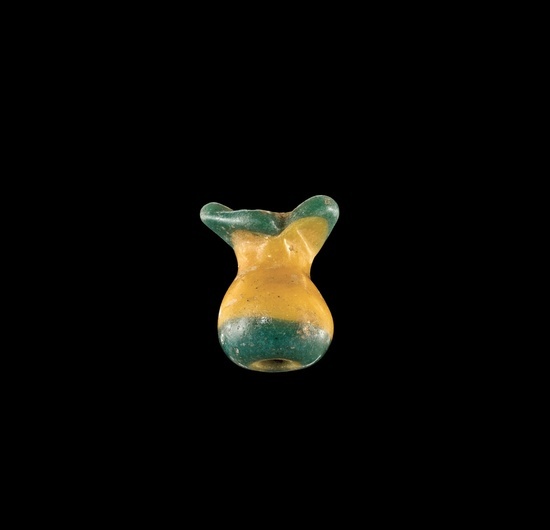 In addition to ornament, glass beads grew to be essential visual signifiers of power, wealth, and the different stages of the life cycle. Those who hold great power have used glass beads to assert their position both in their society and to the outside world. 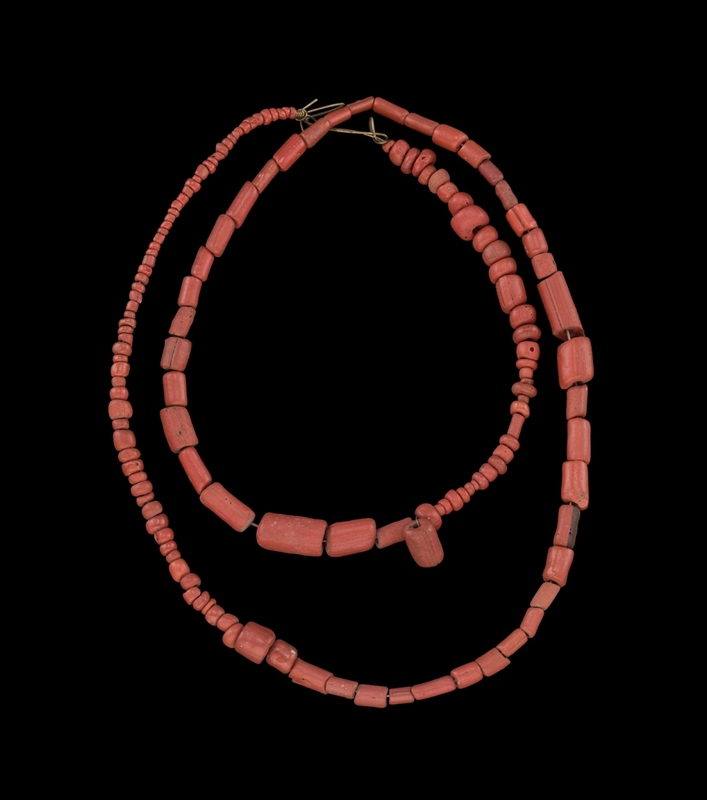 The African chief who wears a precious imported Venetian chevron bead, handed down through generations, lets the world know in its wearing that he is valued in his society. Beads also signify wealth: the more beads one has or the rarer the bead, the wealthier that person is. 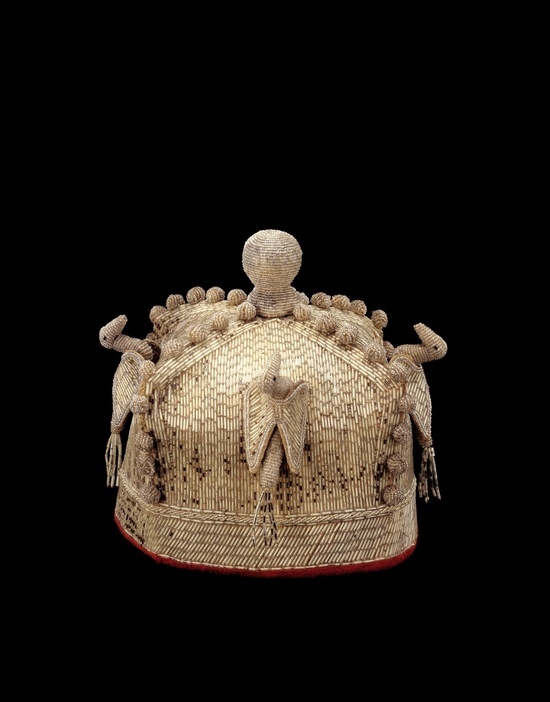 The Yoruba kings of Nigeria are covered head to toe in elaborate beadwork garments and accessories, asserting not only their right to be the only owners of beadwork, but to show how much they are able to acquire. Life cycles are often marked with articles of clothing with specific decorative elements. 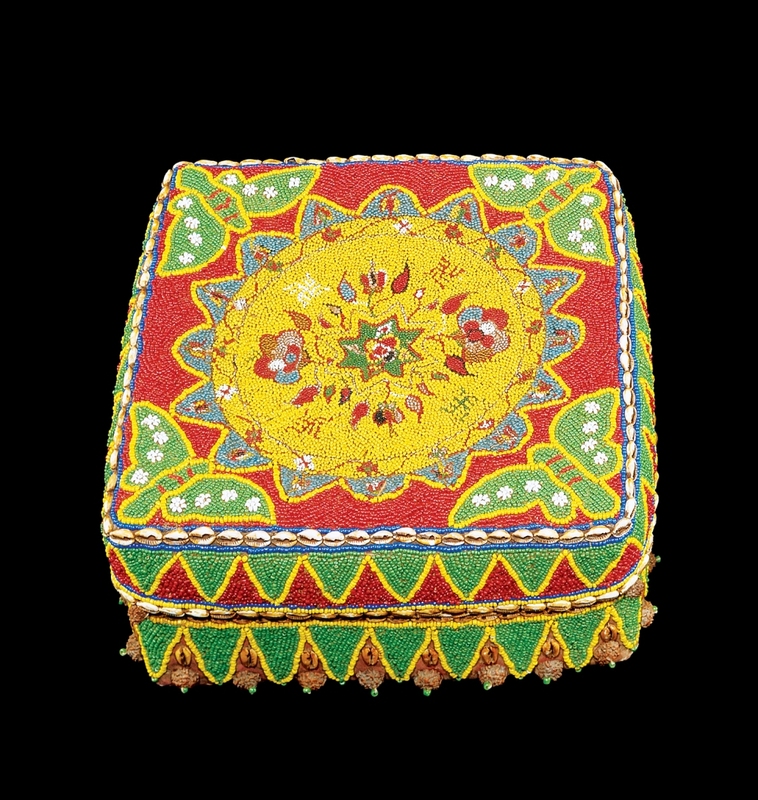 In American Indian and Indonesian cultures, baby carriers or cradles are fully beaded with specific motifs and added elements to protect the nascent soul and to comfort the child, while also existing as a beautiful object. 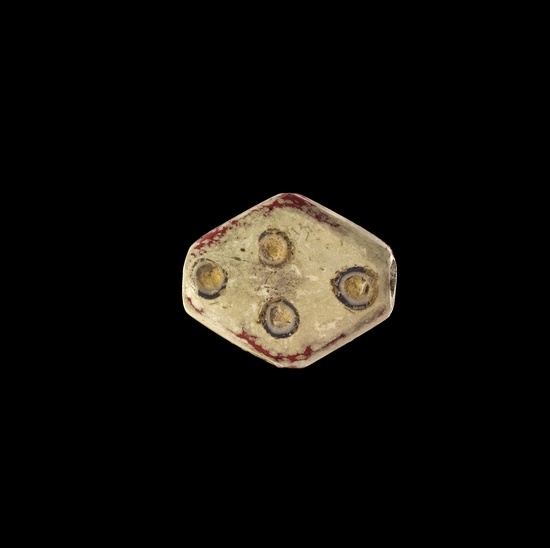 Pendant, formed on core or wire, trail-decorated, tooled. 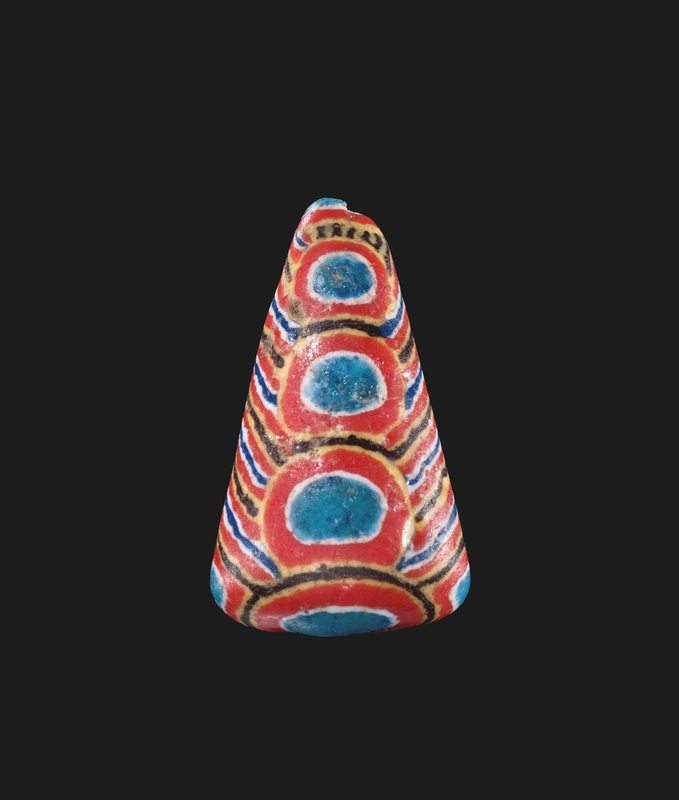 Egypt, 1400–1100 B.C. 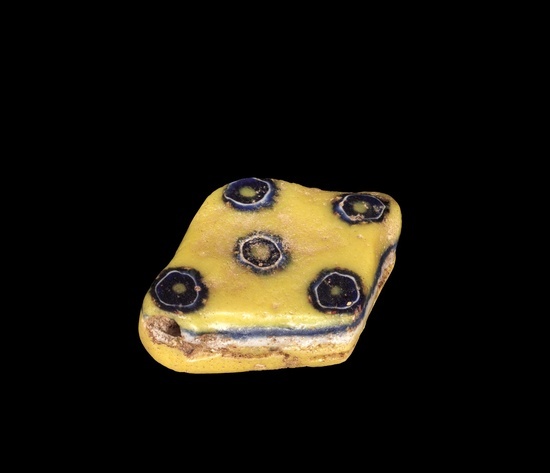 The use of glass beads for ritualistic purposes has often been a key aspect in their production. 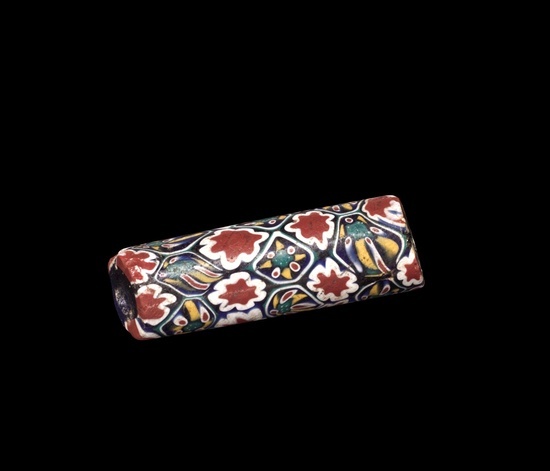 They are frequently used within ceremonies, but also as ritualized objects themselves. Their color or pattern, the way they are worn, or their placement in burials, all refer to their spiritual or ritual nature. 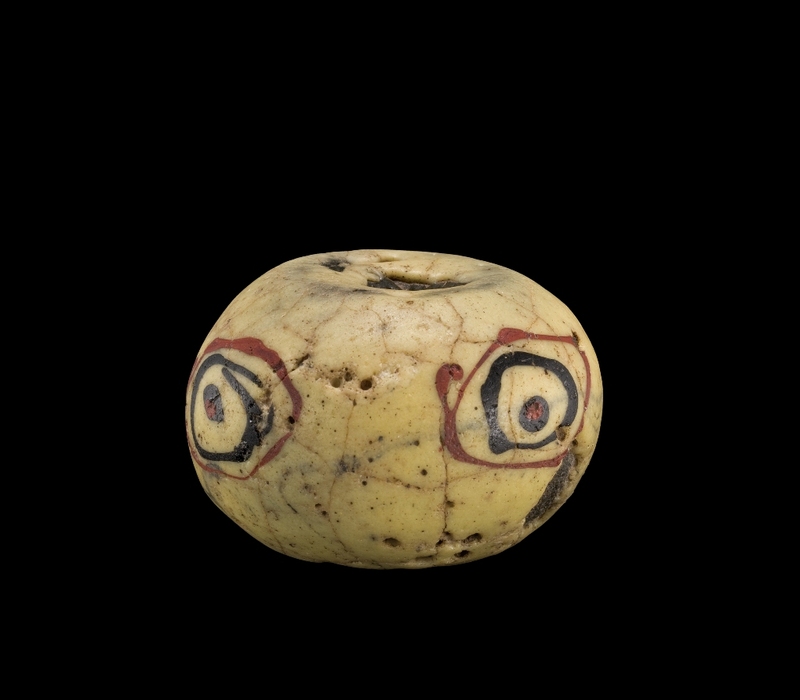 The eye bead, used as an apotropaic device to ward off or deflect the “evil eye,” has been found throughout the history of glass beads. 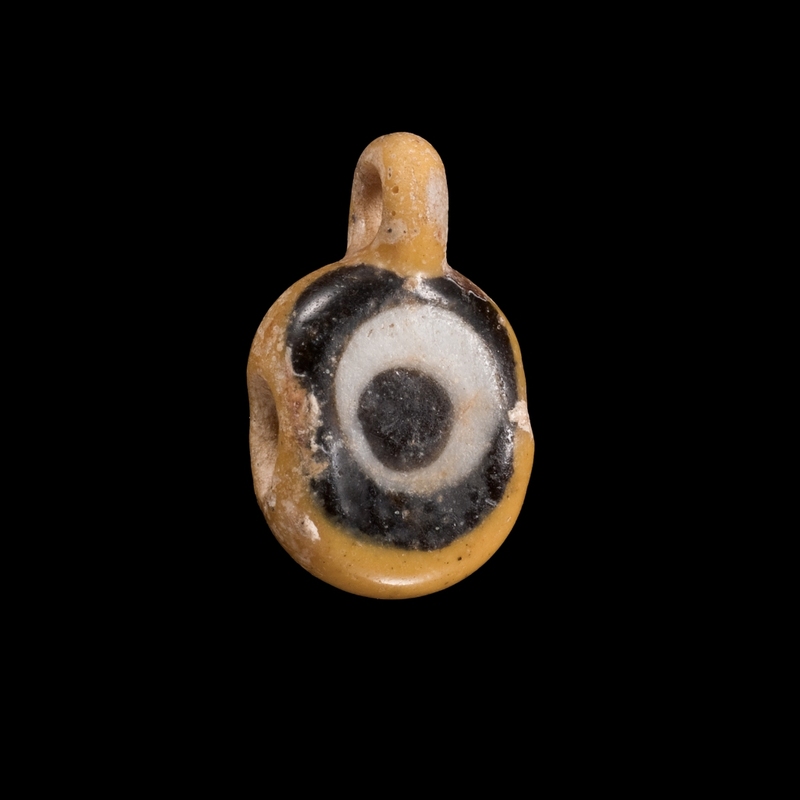 From the simple Egyptian stratified bead, in which layers of glass are used to form the image of an eye, to the famous Roman face beads, as well as the mosaic canes created by Islamic glass makers to create unique eye motifs, all are considered protective and part of a ritual that safeguards the wearer. Face Bead, mosaic, drawn. Roman Empire, possibly Egypt, 1st century B.C.–1st century A.D.
Beaded elephant masks found in the Bamileke culture of Cameroon in Central Africa, worn annually in a dance by a secret society of high ranking men, are used to add ceremony and wonder to this ritualistic event. The glass beads sewn onto the mask highlight the power of the elephant to that society and create distinctive patterns of beauty. 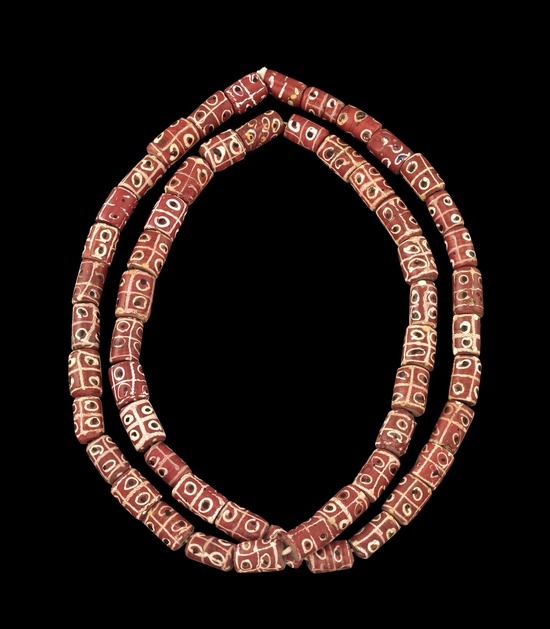 Glass beads became significant throughout the world through trade, and have long been vital to global exploration and exchange. 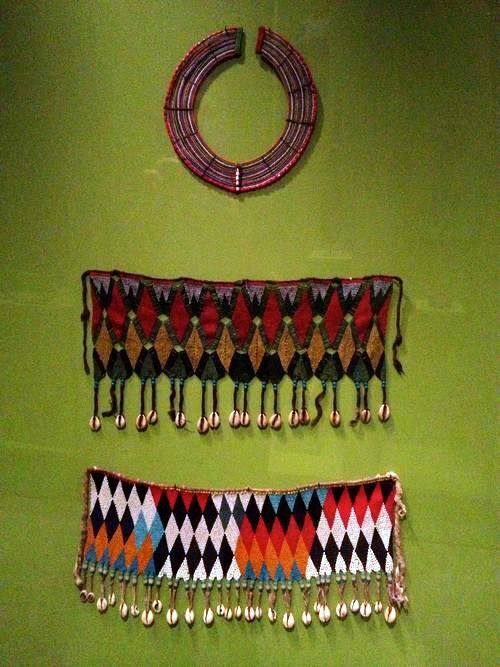 Through the influence of trade, indigenous imitations of imported beads added to the vast network of portable goods. 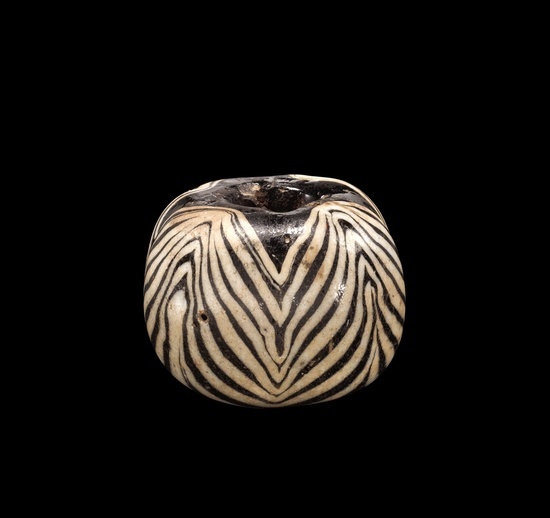 Indo-Pacific glass beads, small monochrome drawn beads that were first produced in southern India as early as 200 BC, have been discovered to be the most traded bead known. Produced for over 1000 years, their manufacture began in India and moved to several locations around Southeast Asia. 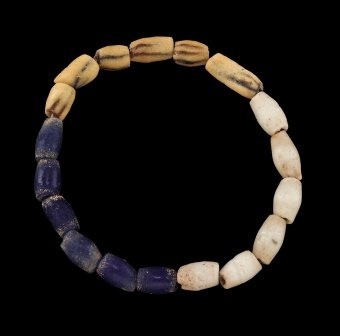 These small simple beads travelled as far as China and West Africa. 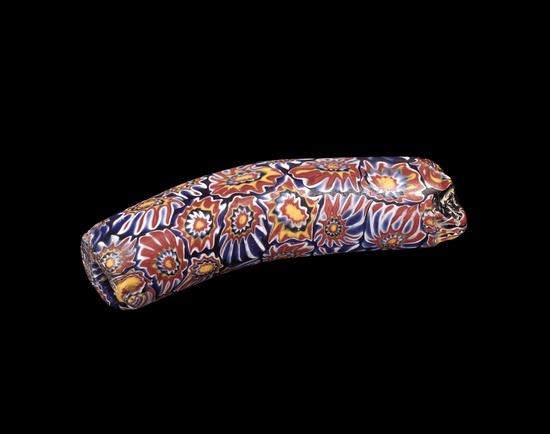 The vast trade bead industry that developed in Venice and spread to Czechoslovakia is an extreme example of the power of glass beads. 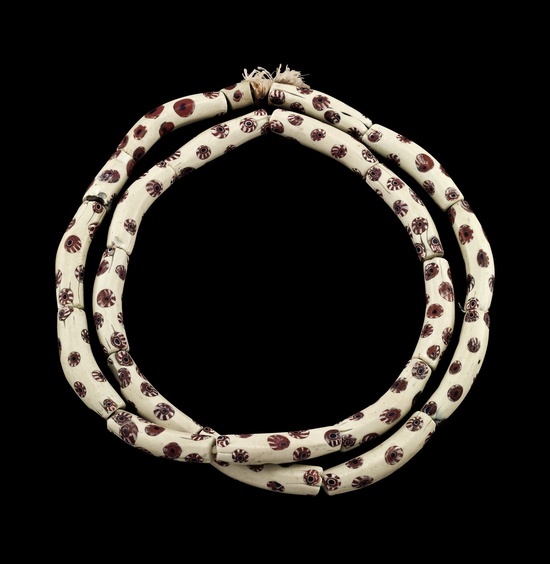 As European exploration and colonization began, many explorers brought along beads as a way to engage with indigenous populations. 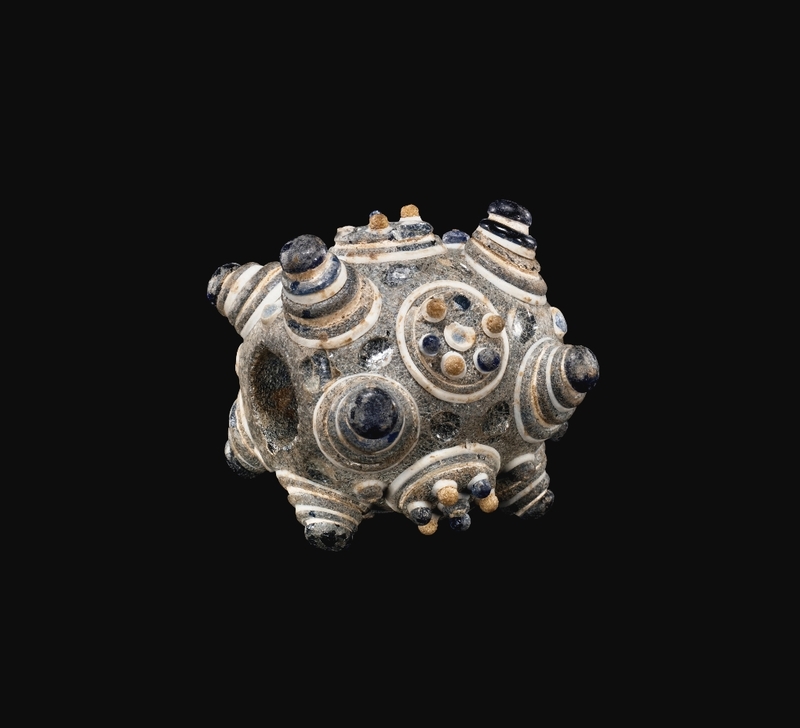 Three Faceted Biconical Beads, ground. Czechoslovakia, 19th–20th centuries. 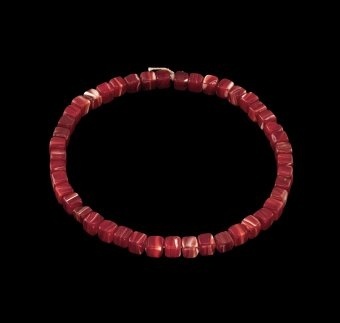 These long, heavy faceted beads were probably made in imitation of garnets or other red stones, such as carnelian. 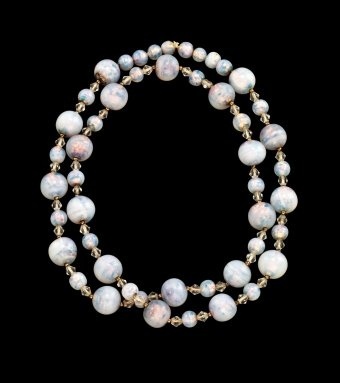 By the 18th and 19th centuries, glass beads were being exported in massive amounts, both as goods for exchange (especially for products from Africa) as well as goods sold for profit. 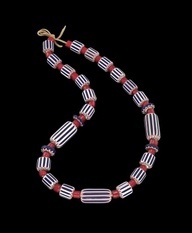 European trade beads have often stimulated other cultures to produce imitations utilizing their own manufacturing methods, while the popularity of traditional indigenous glass beads and beads made from preferred natural materials led exporters to create their own imitative works with profitability in mind. Since antiquity, glass has always been a vehicle for imitation, replicating agate and lapis lazuli as well as jade and garnets. Indeed, much of the original intent in the production of glass beads was to imitate precious and semiprecious stones, and other natural materials. 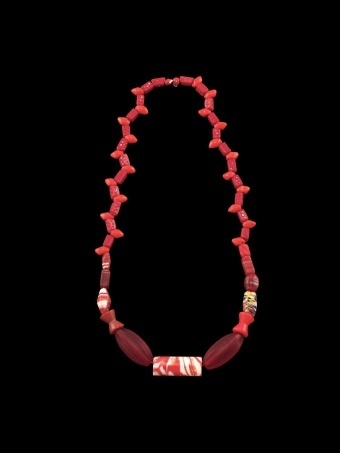 Through trade, glass beads have travelled the globe, finding homes and meanings far from their origins, and creating a network that covers the world and have inextricably linked cultures together. 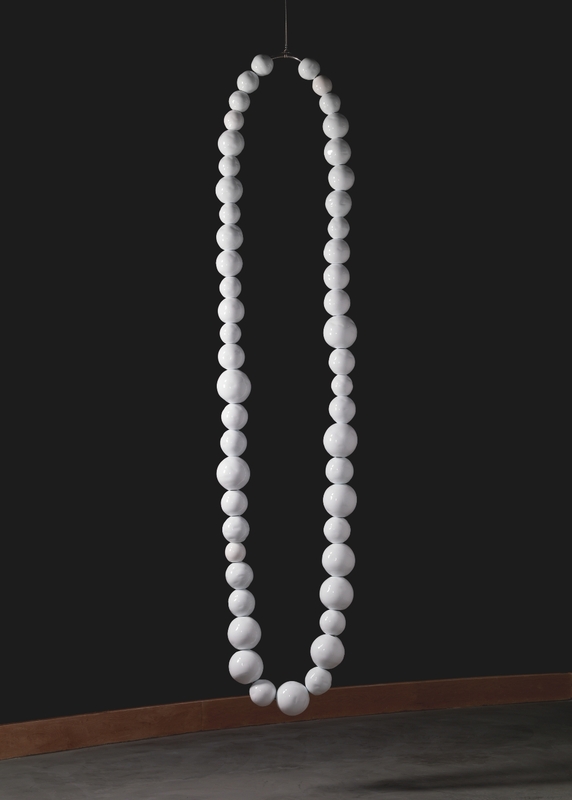 string of 147 Beads, drawn. 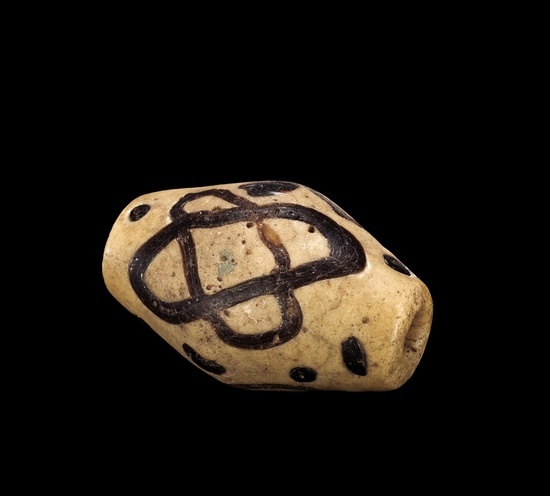 Malaysia, Kuala Selinsing, 3rd–8th centuries. The understanding of the process of glass bead making and bead working is important to understanding the cultural influences and the global spread of bead production. The most common techniques in bead making are winding and drawing. 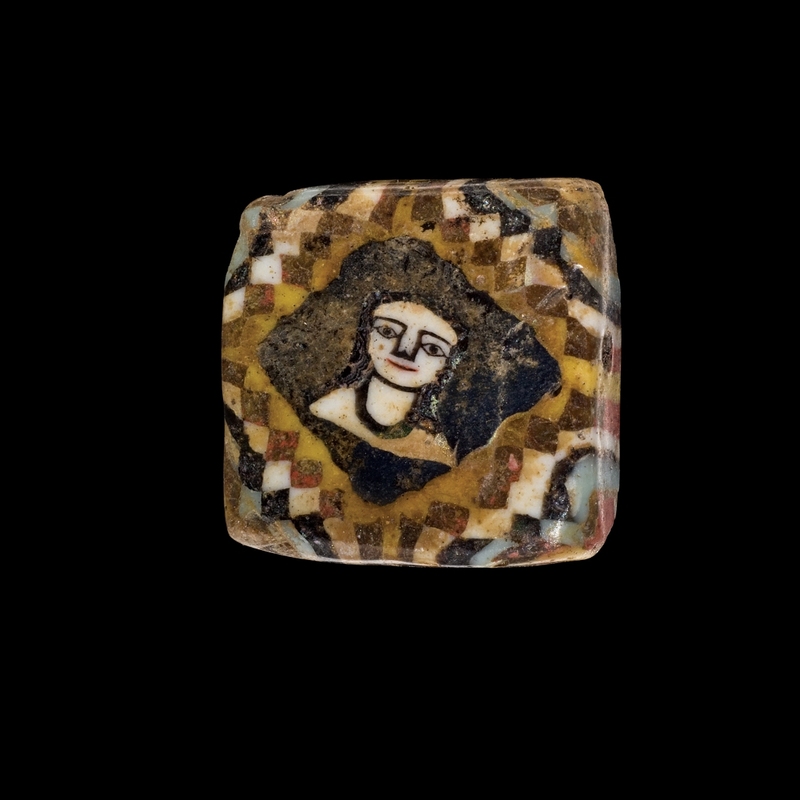 When glass was introduced into bead making in the 2nd millennium BC, the original production method employed was winding. Wound beads are produced by taking dipping a mandrel or rod of some material into hot glass and simply winding that around the rod. 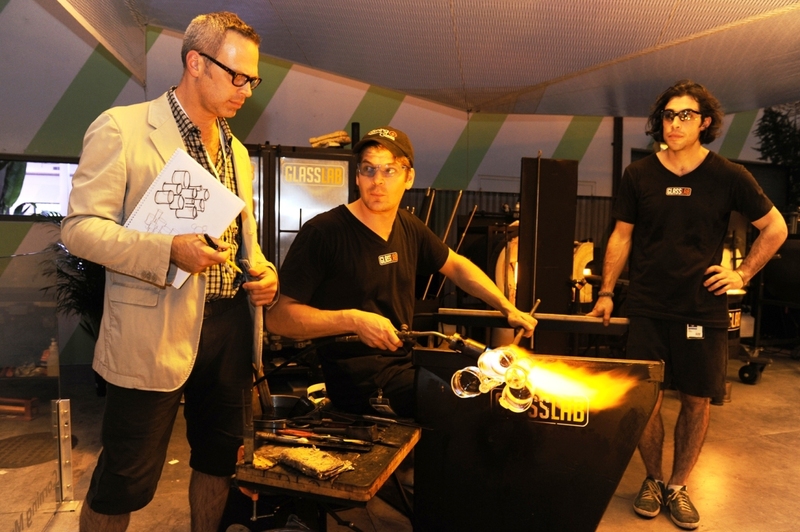 Tools or the walls of the furnace are used to create the desired shape of the glass bead as it winds around the rod. 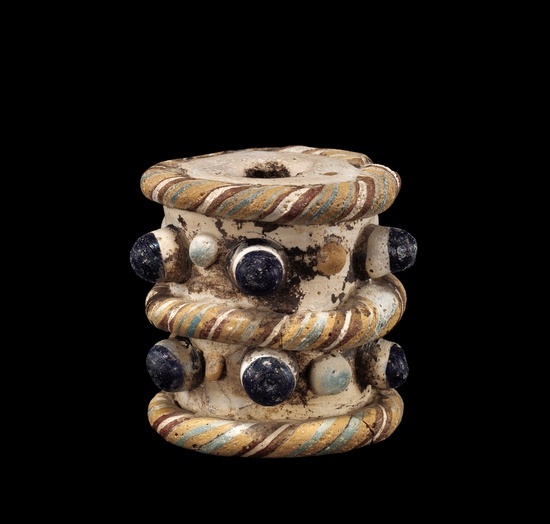 The drawing of canes was known quite early in glassmaking, but was not employed in the creation of beads until the Hellenistic and Roman periods, starting in the 3rd century BC. 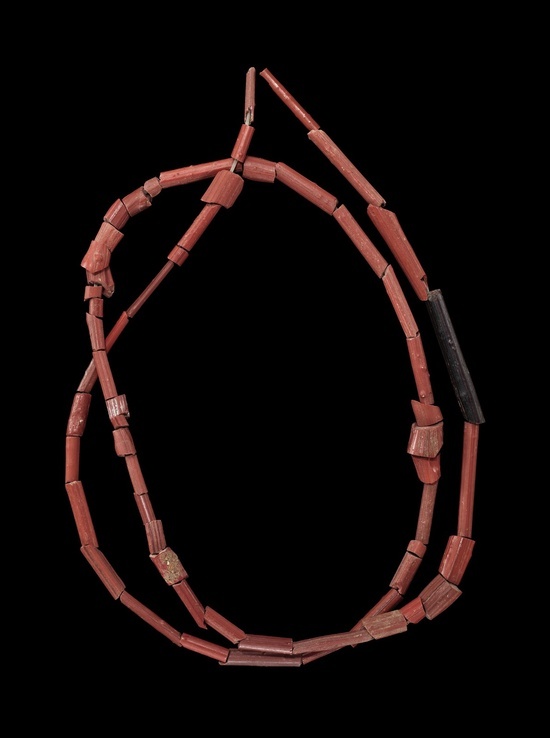 Both winding and drawing enabled the bead maker to generate variations of the original processes. 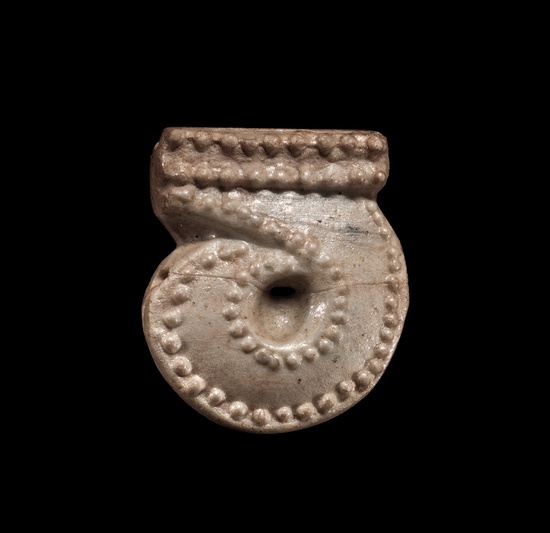 This can clearly be seen in the Lada technique performed in India for drawing hollow canes, which was most likely how the Indo-Pacific beads were made beginning in 200 BC. 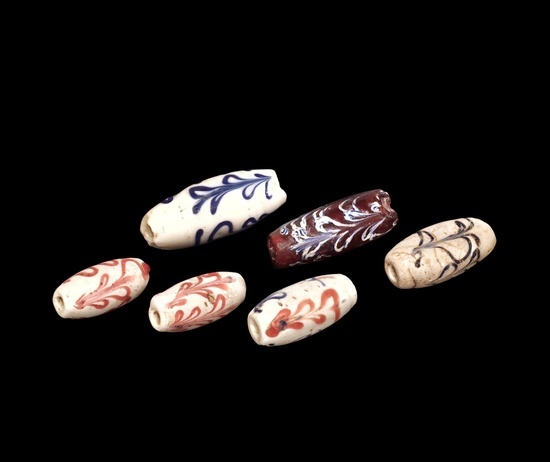 Venetian lampwork beads were an extreme variation of wound beads, and employed extensive decoration in new forms and styles, but at its core the Venetian bead was made on a mandrel as it had been for centuries. As time progressed, technological innovations such as the mold-press initiated new techniques, allowing beads to be made faster and more consistently in style. Mold-pressing is most frequently associated with Bohemian or Czechoslovakian bead production. 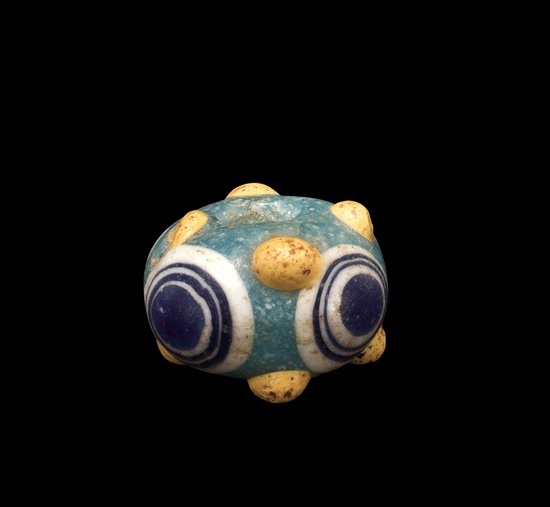 As beads were traded throughout the world, unique new forms of bead production began, as can be seen in West African powder glass beads. 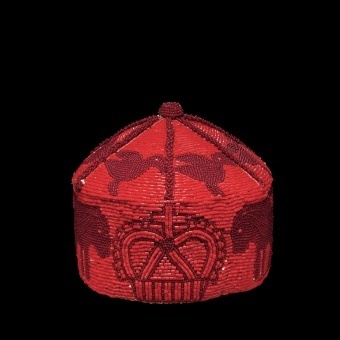 Beads also were incorporated into traditional crafts. 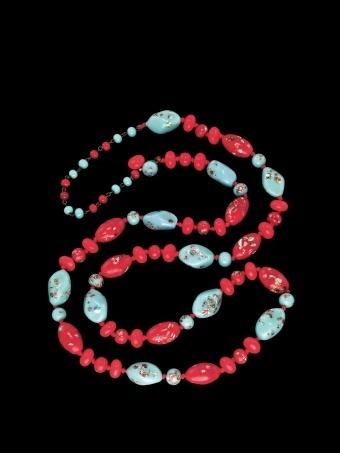 Bead working spread throughout many regions as the availability of European glass beads rapidly grew. 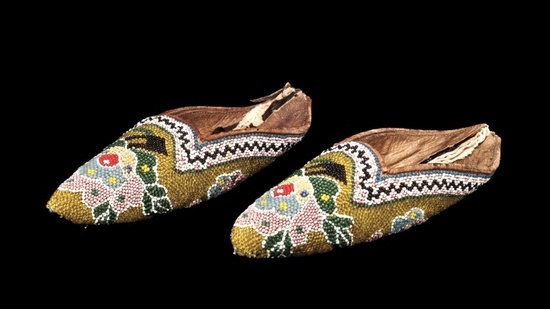 The use of bead work fulfilled the roles of ornamenting clothing and other items that had been previously made in various traditional materials, but also inspired completely new craft forms. 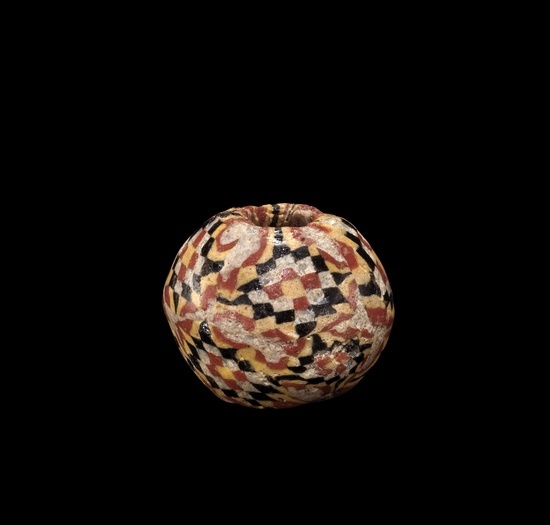 An understanding of the formation of these distinctive objects shows both the similarities and differences in the production and use of bead work around the world. 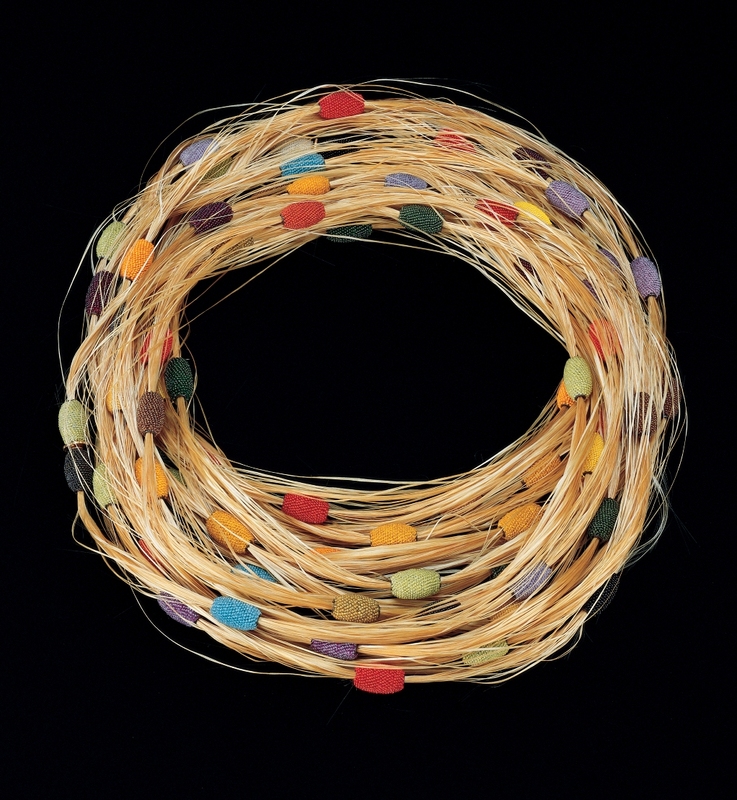 By exploring these themes, the exhibition examines how diverse cultures use beads in similar ways to proclaim their societal values, but within their own traditional motifs and crafts. Objects that look utterly different can have similar meaning and use, such as carriers for young children or clothing that signifies a powerful status. 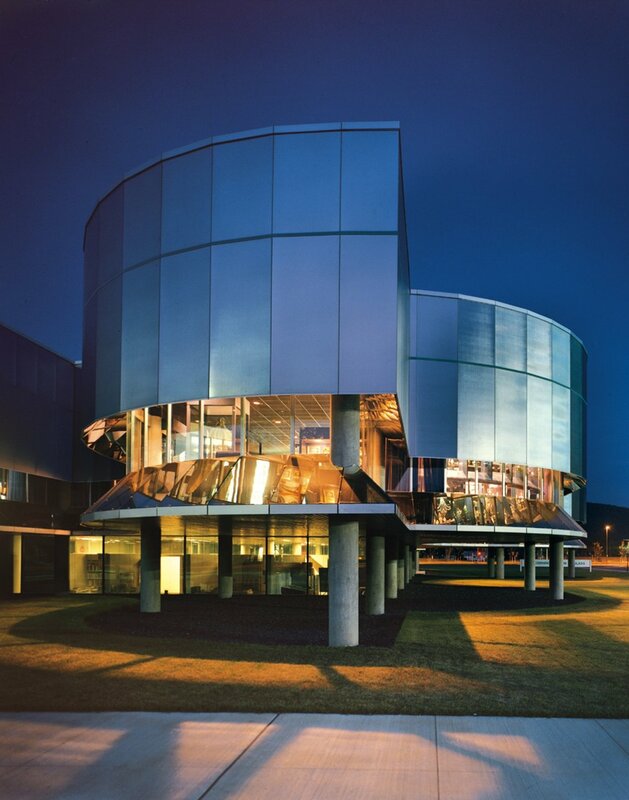 The Corning Museum of Glass is the foremost authority on the art, history, science, and design of glass. 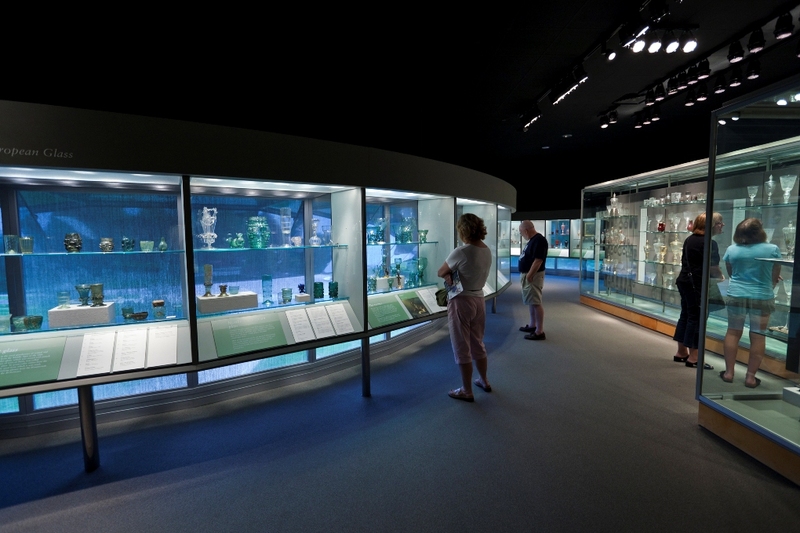 It is home to the world’s most important collection of glass, including the finest examples of glass making spanning 3,500 years. 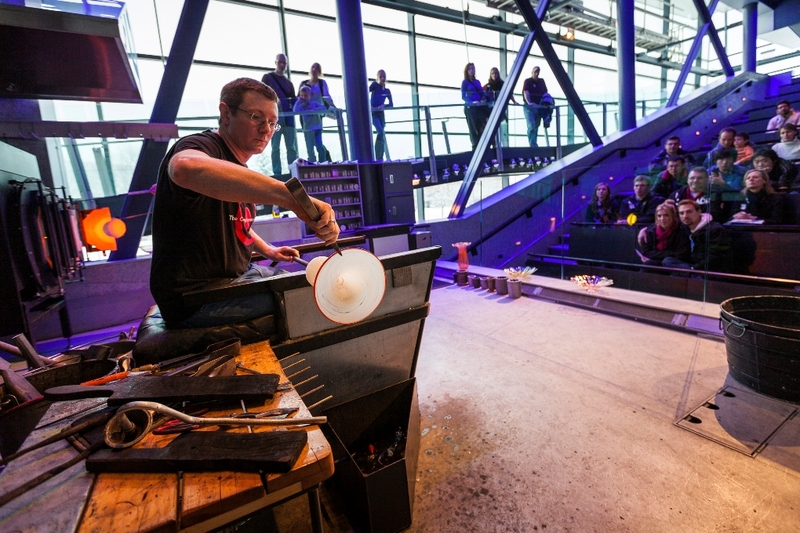 Live glassblowing demonstrations bring the material to life. 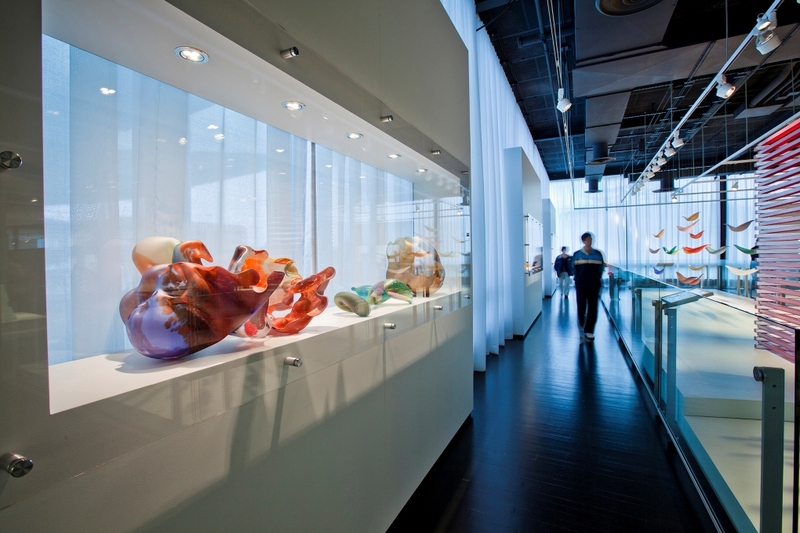 Daily Make Your Own Glass experiences at the Museum enable visitors to create work in a state-of-the-art glassmaking studio. 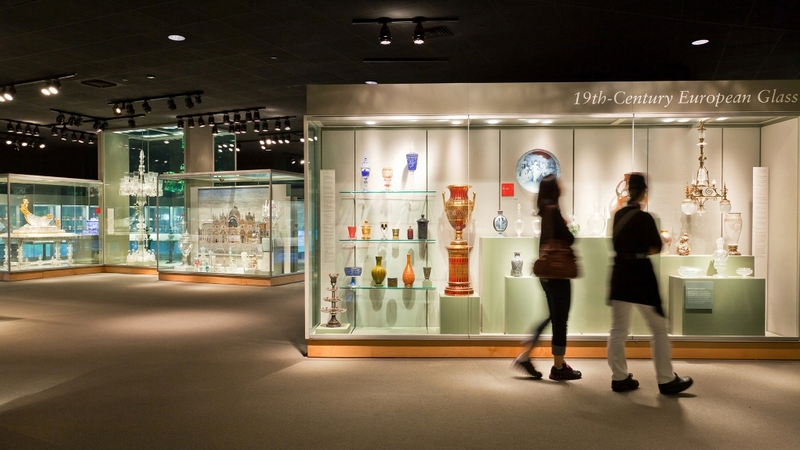 The campus in Corning includes a year-round glass making school, The Studio, and the Rakow Research Library, the world’s preeminent collection of materials on the art and history of glass. 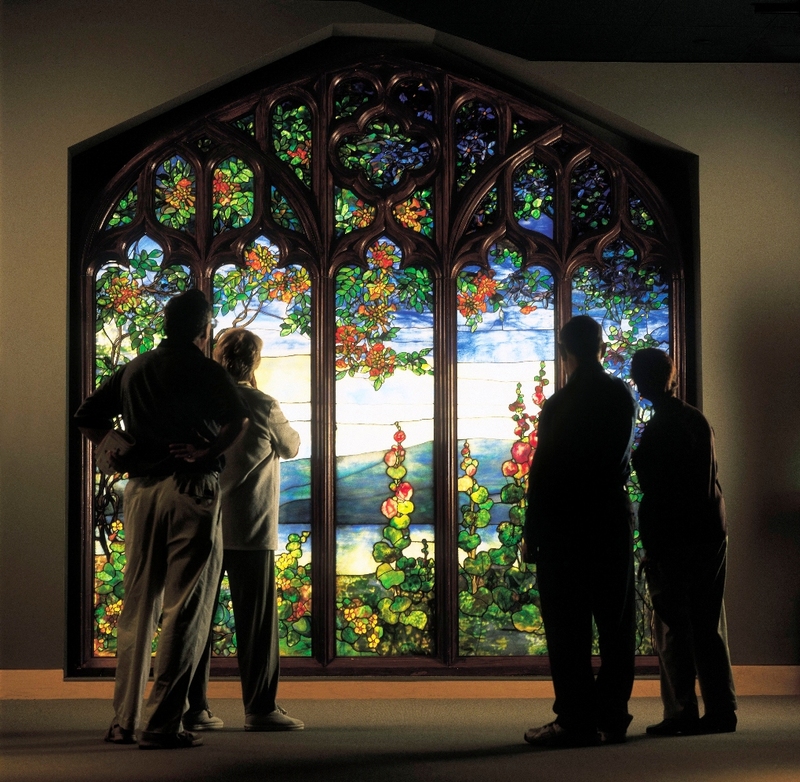 Located in the heart of the Finger Lakes Wine Country of New York State, the Museum is open daily, year-round. Adrienne graduated from The George Washington University in 2001 with a B.A. in Anthropology and a minor in Art History. She attained her M.A. 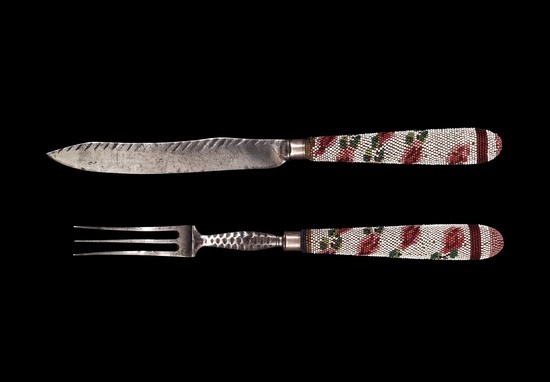 in the History of the Decorative Arts from Parsons The New School for Design in New York City in 2006, where she focused on 18th century English silver and 19th century French furniture. She has held positions at The National Gallery of Art and with the American art department at the Philadelphia Museum of Art. 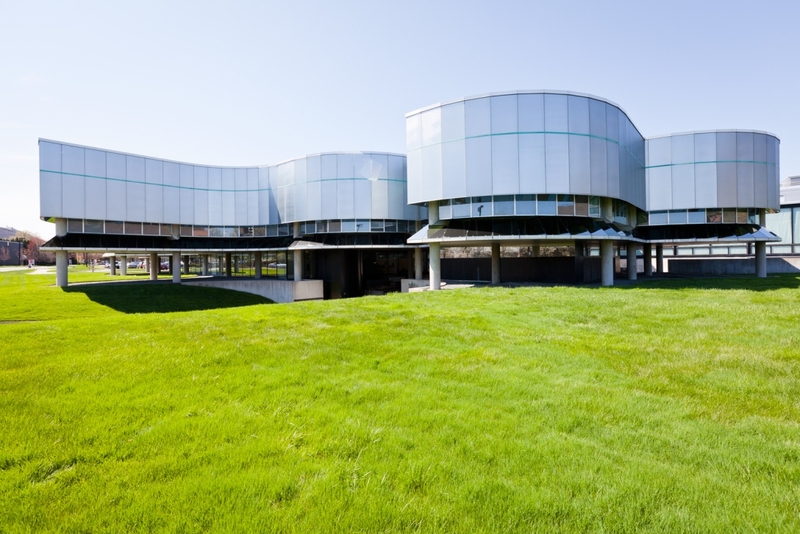 At the Corning Museum of Glass, in Corning, NY, where she was employed as the Curatorial Assistant. 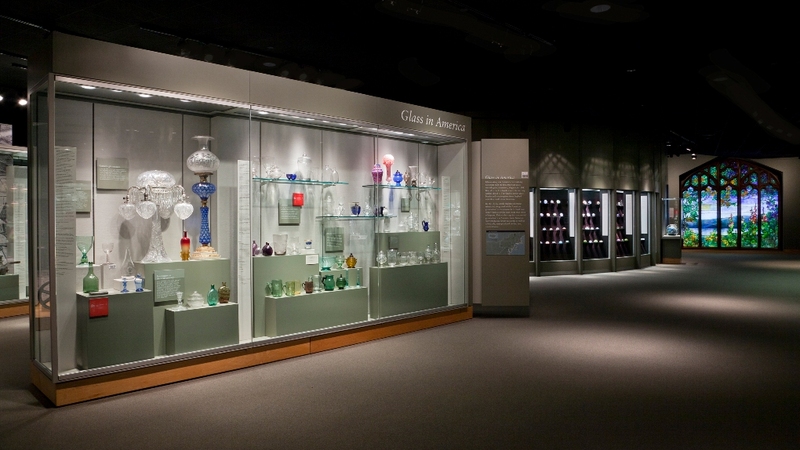 In that position she worked with all four curators to research, preserve, and grow their large and diverse collection of glass.. 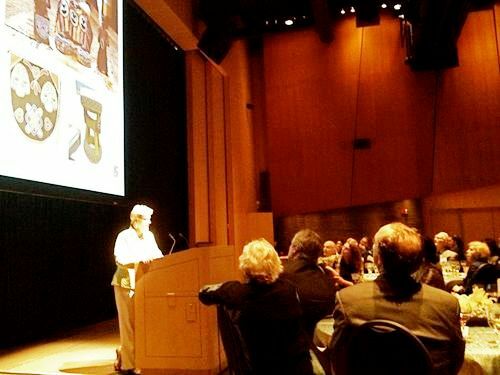 Her experience teaching in the undergraduate classroom is what piqued her interest and ambition to work within a university museum. The ability to use a museum collection to teach diverse curriculums through art is exceptionally exciting to her as she believes that art has the ability to tell students so much about culture and history from a point of view that many have not considered. Harry Allen was born in the US in 1964. He graduated from Pratt Institute in 1994 with a Masters of Industrial Design, and soon after opened his design studio in lower Manhattan. 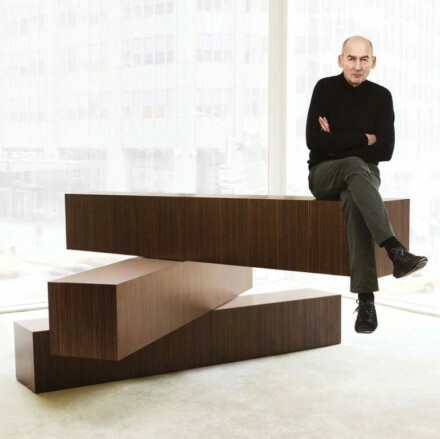 As a consulting designer he works on a broad spectrum of projects including interiors, products, furniture, lighting, exhibitions, and graphics. 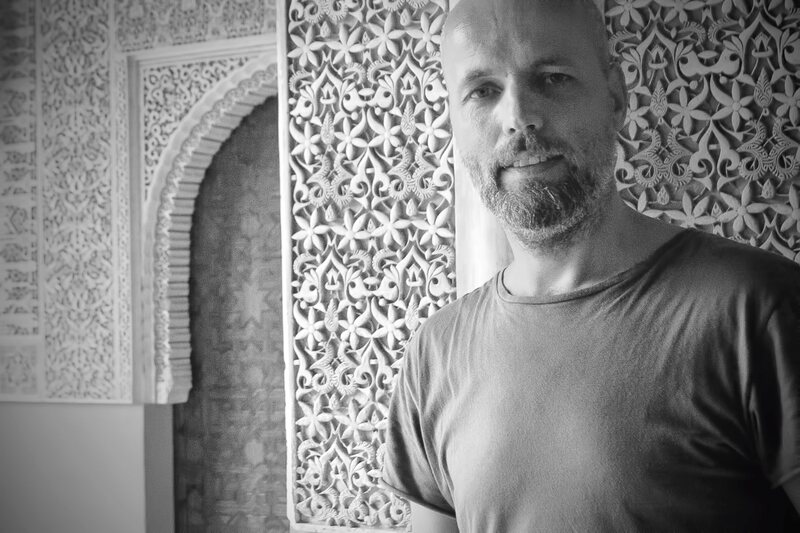 Stefan Hengst is originally from the Netherlands, where he attended St. Joost Academy in Breda. Hengst moved to New York City in 1996 to join World Studio as a senior designer, and struck out on his own to found 2K+ Design in 1998. 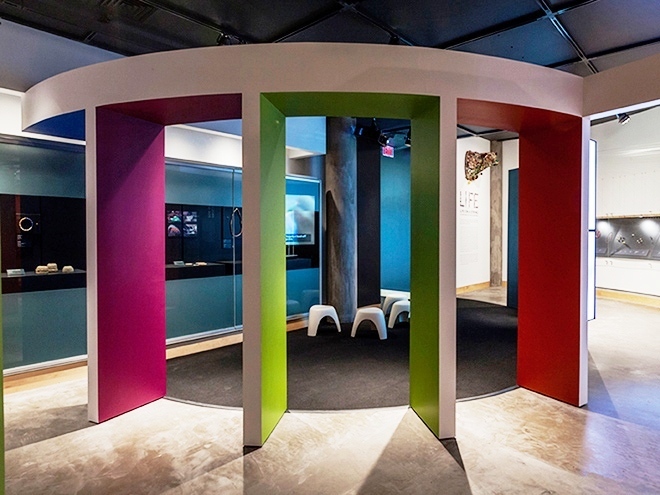 He also shared a partnership with xSITE, working with Ingeborg Bloem and Klaus Kempenaars on several projects throughout Europe and North America. 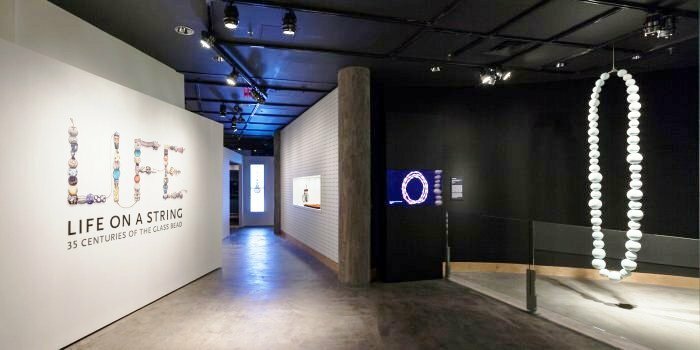 In a career spanning more than 20 years, he has been included in several exhibits and gallery shows and has won awards for his design and photography. 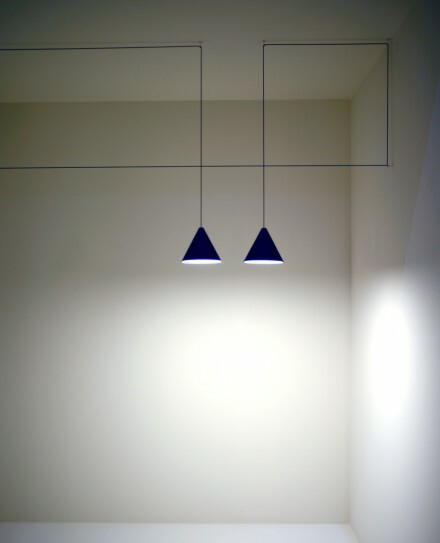 Michael Anastassiades, showcased his String Lights ceiling lamps at Flos this year. The black electric wire that sets up a relationship with the architecture of a space, precisely becoming part of the lines formed by the walls of a room. 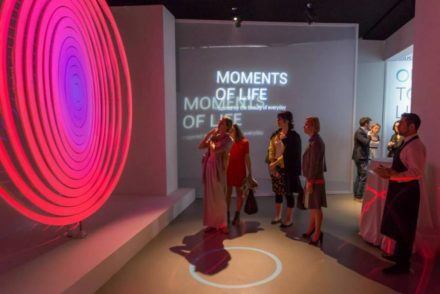 The “Our Touch of Life” theme focused on ASUS’s design philosophy of creating truly personal products that connect emotionally with the user to produce memorable experiences. 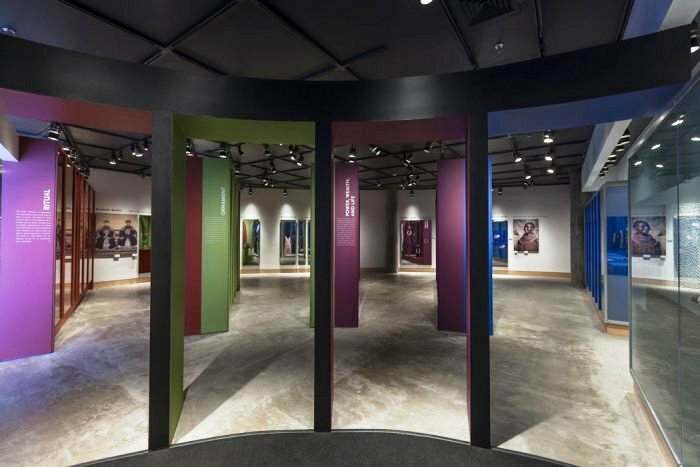 The exhibition featured a stunning creative installation by ASUS Design Center and a product gallery with a wide range of ASUS products on display. 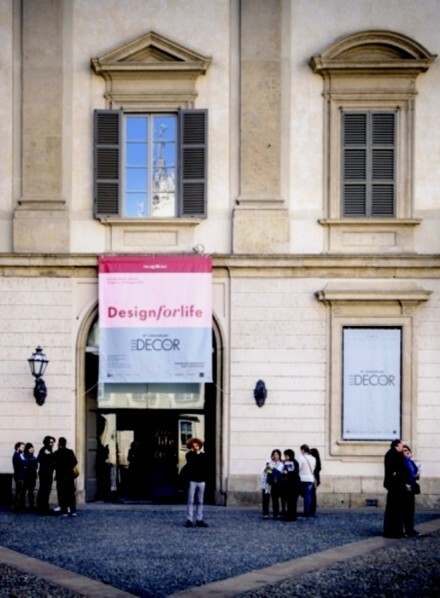 Elle Decor Italia presented an exhibition at the Palazzo Reale, on the concept of Milanese ” Design for Life ” which presented ( with a cinematic eye ) 25 years of interior design as told through photographic shots of homes as seen in Elle Decor Italy magazines from 1990 until today – to communicate ways to live, to furnish, decorate, express themselves. Entitled “Leonardo 1452-1519”, the exhibition, explores the central themes of the multi-faceted work of Leonardo: the drawings; the reflection on the arts and on the antiquity; the great innovation of the “motions of the mind”; the focus on utopian projects and the mechanical automation. 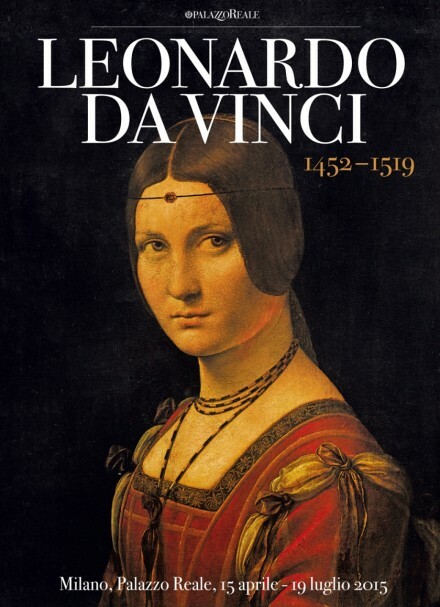 It includes paintings, drawings, sculptures and manuscripts, brought together from the finest museums in the world, amongst which the British Museum in London, the Uffizi in Florence, and the Metropolitan Museum in New York. It is strange that still today in 2014, Milan and Italy are 90% closed on Sundays. 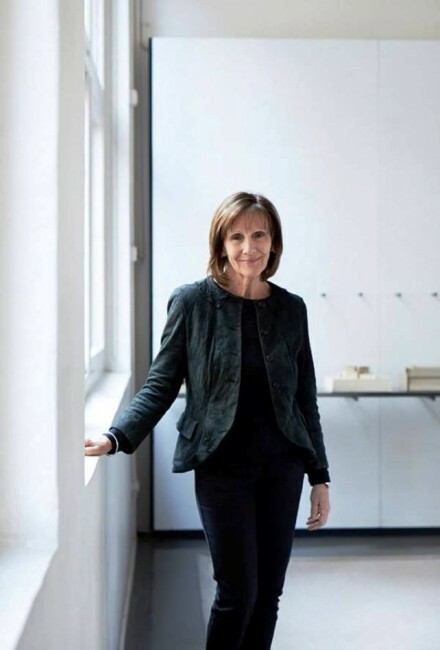 Sue Carr is an interior designer, educator and indefatigable promoter of the benefits of good design, she has worked throughout her career to raise the profile of Interior design as a worth-while and recognised profession.